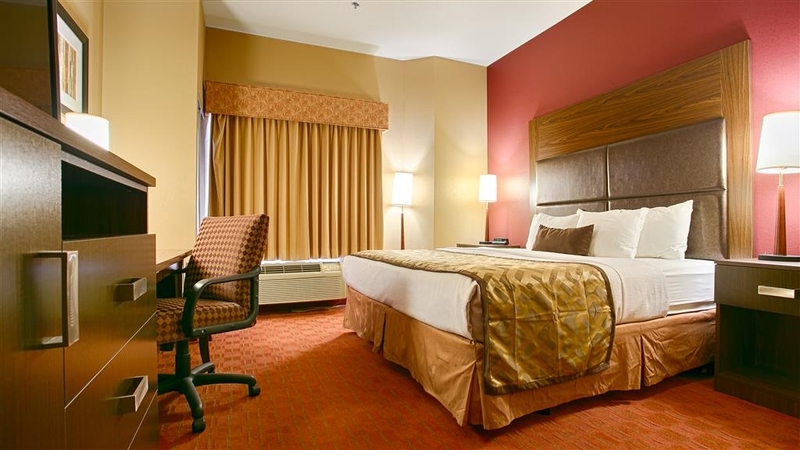 Il Best Western Plus Woodland Hills Hotel & Suites è situato nel centro di Tulsa. L'hotel è vicino alle principali attrazioni turistiche. Approfittate tutto l'anno del miglior prezzo garantito e di offerte esclusive. Il Best Western Plus® Woodland Hills Hotel & Suites, interamente non fumatori, è situato in ottima posizione appena fuori dall'autostrada 169, a pochi minuti dalla frenesia del centro cittadino. L'hotel di Tulsa, Oklahoma, è comodo per la sua vicinanza a molti istituti scolastici, stabilimenti e sedi aziendali, strutture sportive, centri commerciali, ristoranti e importanti mete turistiche. L'Aeroporto Internazionale di Tulsa è a circa 16 km. I musei locali e il Tulsa Performing Arts Center offrono proposte culturali per tutte le età. Il Tulsa Expo Square ospita numerose iniziative stagionali. Il Tulsa Oktoberfest è famoso in tutto lo stato. 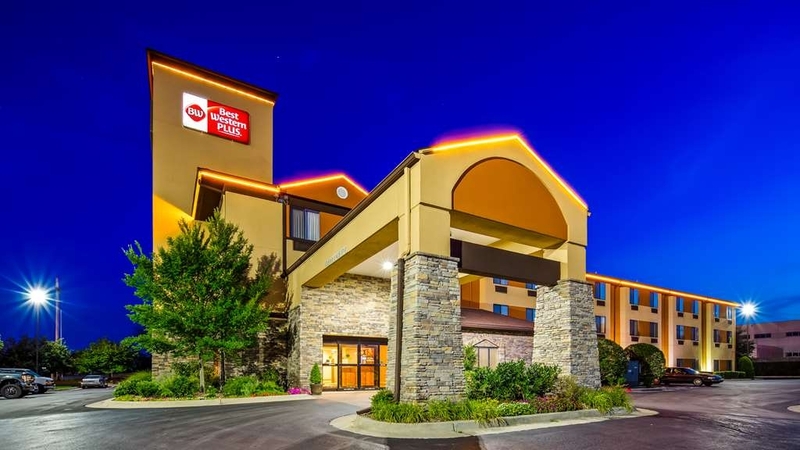 Il Tulsa Zoo and Living Museum e l'Oklahoma Aquarium® sono a meno di 16 chilometri dall'hotel. L'area circostante conta diversi ristoranti e sale cocktail. Entrando in hotel gli ospiti trovano un ambiente caratterizzato da tessuti europei, colori vivaci e ricche texture e quel tocco giusto di eleganza e raffinatezza. L'eleganza dei dettagli sorprende e supera ogni immaginazione. Molti mobili sono disegnati in maniera esclusiva. Questo hotel di Tulsa, Oklahoma, dispone inoltre di palestra, piscina coperta riscaldata e idromassaggio. I viaggiatori d'affari apprezzeranno la comodità del business center interno, l'accesso ai servizi di copiatura e fax, le grandi scrivanie e la segreteria telefonica. Tutte le camere spaziose dispongono di asciugacapelli, ferro e asse da stiro, bollitore per tè e caffè, microonde e frigorifero. L'hotel dispone inoltre di suite Executive con letti king size e suite con divano letto, vasca idromassaggio, vasca da bagno e docce a getto. Per la comodità dei nostri ospiti abbiamo una lavanderia a gettone e offriamo il servizio di un cameriere personale. Chetu sia in città per affari o in visita o semplicemente di passaggio, fermati al Best Western Plus Woodland Hills Hotel & Suites. Superare le tue aspettative è nostro obiettivo e l'ospitalità è il nostro business! Ti auguriamo un soggiorno gradevole! "Cozy room could be better"
I have used Best Western before, oddly a little busy this weekend (Saturday 04/13) our room was clean,but not many outlets for charges.I had trouble with the Shower head ,so had to take a bath. Breakfast was ok, the usual make your own waffle, bacon , biscuits and gravy...I didn't try it ,but my kids seen to like it. Pool was pretty warm, hot tub was a bit too hot. Only couple issues I had was I accidentally left my charging cord at the pool and instead of someone returning it,they kept as a souvenir. People were loud, I thought I heard a drunken fight down the hall. Pool was really busy,parents wouldn't watch their kids and tell them to have some respect for others,but wasn't surprised. Beds were pretty comfortable . Thanks for taking time to let us know about your stay, we appreciate your business. We take comments and suggestions from our guest seriously and make necessary changes, we appreciate your opinion. Hope you will consider staying with us in future. "Dated - Plus rating - really??" Very dated hotel. Rooms fairly clean. Could have used another blanket on the bed and found myself waking up cold every night. What was really horrible to see was all the cigarette butts everywhere outside. You would think they would want the outside to reflect what to expect inside. The laundry vents are by the entrance of the hotel and there is lint all over outside. The pool and hot tub was so full of people on Saturday with nobody monitoring horseplay. Sunday a guest was drinking beer in the hot tub with a sign above him clearly saying no alcoholic beverages allowed. Staff were pleasant and got some help from one gal on evening shift with getting a toy out for my grandson. Breakfast mediocre - coffee good. You pay for the safe in your room regardless if you use it. Its a separate fee on your bill. We apologize for the inconvenience while staying at our hotel, all the comments and suggestions given by our guest are taken seriously and act upon it. Hope you will give us another chance to make your stay comfortable and relaxing. We've stayed here a couple times. The staff are generally friendly. Walking through one of the clerk's cloud of cigarette smoke to get into the hotel wasn't fun. Both times we have stayed, the hot tub has been broken. This last time we didn't even get a room with a bath tub. The pool wasn't warm enough for me to want to get in. That kind of wrecked our stay for me and my kids. Breakfast was pretty good. It was fairly quiet. Check in and check out were simple. Next time, we're going to look for another place to stay. We want to thank you for taking time to let us know about your stay and are sorry that you had less than perfect stay. Be rest assured that the points you have raised is addressed with appropriate staff and necessary steps has been taken for it not to repeat. We take pride in our hotel and we hope that you will give us another chance to earn your trust back. Please give me a call directly and I will make sure that we do everything in our power to make this happen. Friendly staff, good breakfast, nice pool and comfy beds! The jetted tub was a nice plus too! 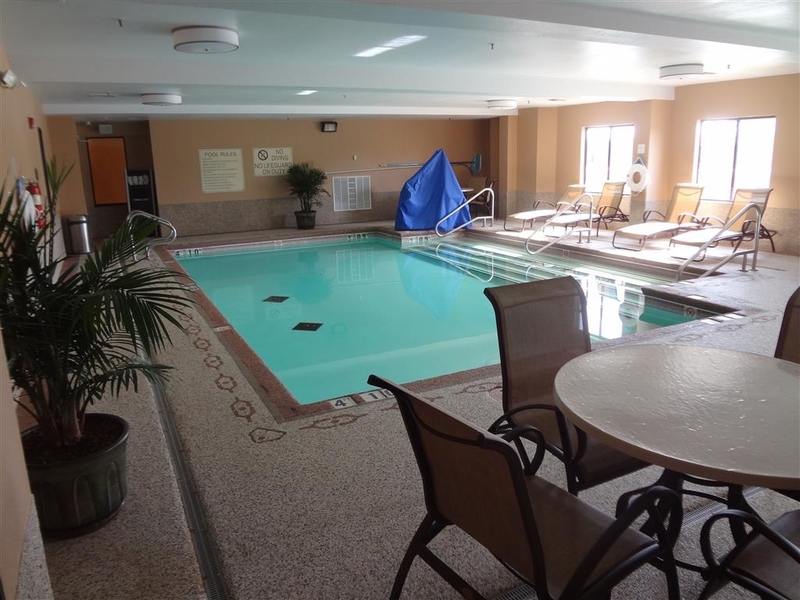 It was a nice family environment, and the kids enjoyed the indoor pool while the adults enjoyed the jacuzzi. Thank you for taking time our and letting us know about your stay. We are glad that you enjoyed your stay, particularly breakfast, pool, comfortable beds and hot tub. We look forward to seeing you again in future if need arises. This location is a bit secluded and some will find it hard to get to,especially after dark But the quiet location makes it a place I will come back to.and worth the effort. The breakfast was also very good with a nice selection of hot food. Thank you for your business and we appreciate your business and look forward for you staying at our property in future. Stayed for 4 days, the Hotel was clean, well kept; and the staff was extremely nice. Check In and Check Out took just a few minutes. We received a free newspaper every morning. They had a complimentary Continental Breakfast. Thank You for your feedback, and we appreciate your business, we hope to see you again in the future. Our second floor room was huge, and nicely appointed with a sofa, and a table with two upholstered chairs, great for playing games, or having a bite to eat. The bed and pillows were very comfy, and the room was quiet. The bathroom was spacious, and everything appeared clean. Breakfast was standard hotel fare, nothing special. 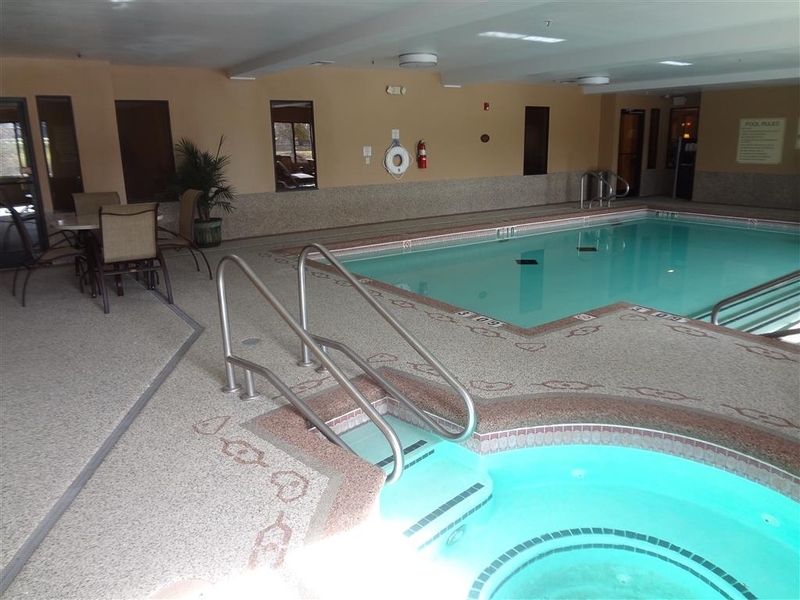 The indoor pool and hot tub looked inviting, although we didn't use them. There were three machines and a weight machine, in the fitness center but there was no way to adjust the temperature of the room, and it was rather warm for a workout. The tv remote made it difficult to flip through the channels, and there was no guide. 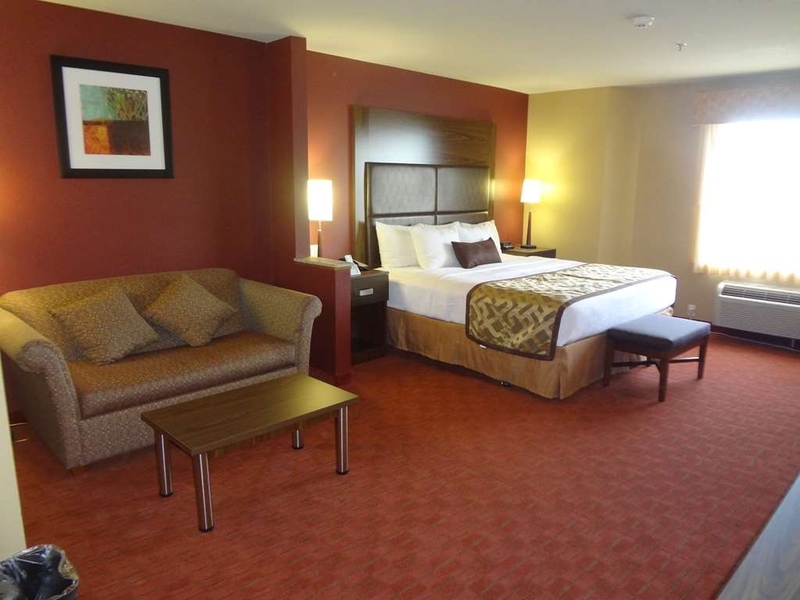 Overall, this is a great place to stay, and very reasonably priced. Our experience was great. I would gladly stay there again. 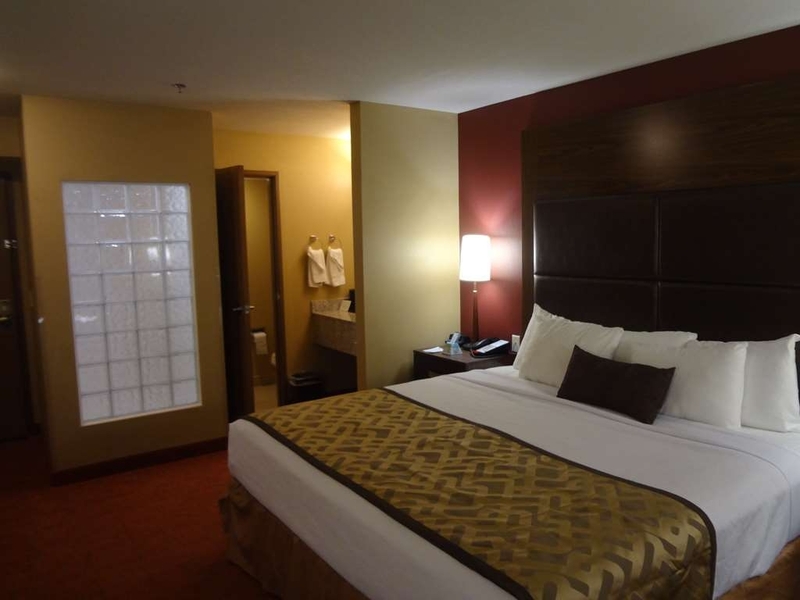 The room was fantastic and the service was very good. The breakfast was very good with a great variety of food served. The room was spacious. Thank you very much for your business and kind words, we look forward to seeing you in future. The exterior was not very appealing. But our room was perfect! The shower was huge. The bed was comfy and it was pretty quiet! Denise was super nice when we checked in. She was very helpful. The ladies at checkout were bubbly and nice as well! Overall, the exterior appearance is not appealing. The deco is a bit outdated. But tje room was noce and comfy. The air worked well, the pool was clean. We really enjoyed our stay. Thanks for your business and look forward to seeing you in future. Nice clean hotel near everything! 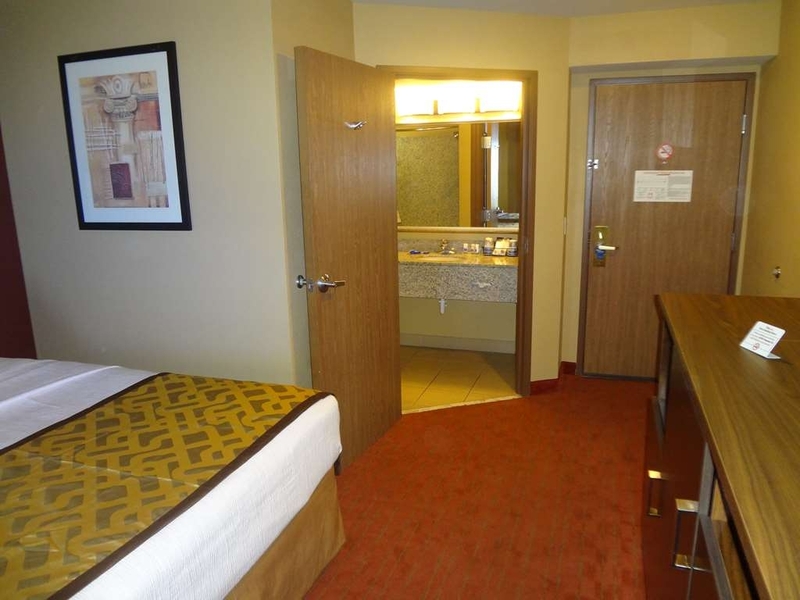 Room was clean and quiet with nice beds and bathroom with tub/shower. 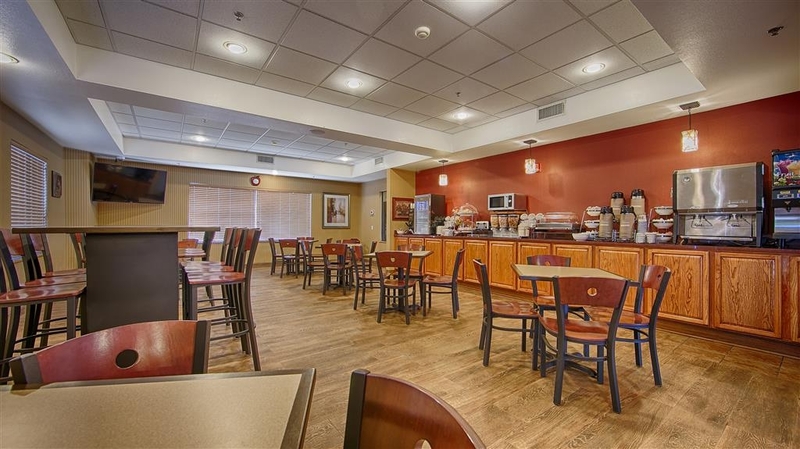 Breakfast was easy and location was close by the amenities of the San Fernando Valley. Price was reason I chose and location. Stayed here for one night while the Gauntlet obstacle race was in town. Very nice little hotel. Counter guy was very friendly and even corrected one of my mistakes during checkout, all with a smile and great attitude. Breakfast was smaller, but still great. Had biscuits, gravy, scrambled eggs, sausage patties, yogurt, cereal, bagles, and waffles with assorted toppings provided. As well as apple and orange juice, milk, coffee to drink. Thanks for your business and look forward doing business with you in the future. 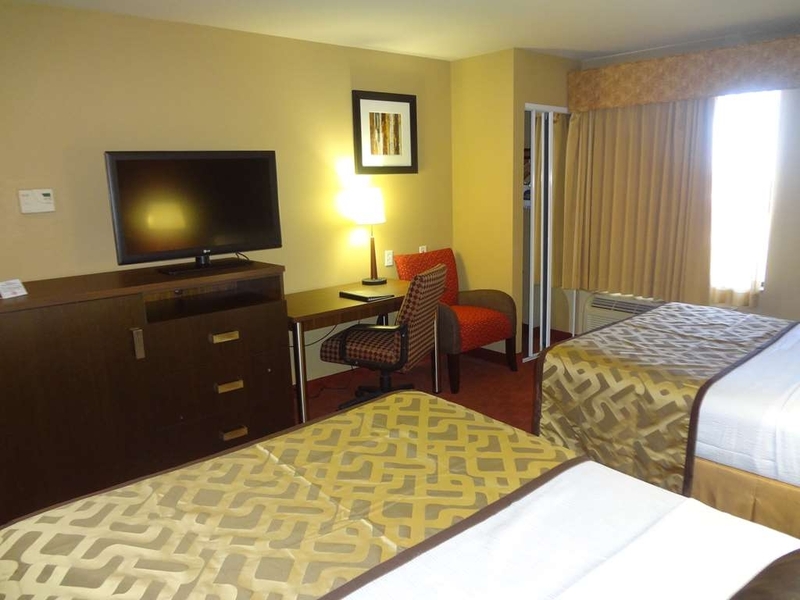 "Best Western Plus Woodland Hills"
The best western located conveniently off of 169 highway is a hidden gem. upon check in we were greeted with a warm welcome and we were pleasantly surprised how nicely appointed our guest room was. Spacious and comfortable. The breakfast had all the right stuff. Coffee was hot and the biscuits, bacon and eggs were excellent. i would highly recommend this hotel to anyone passing thru tulsa or needing a quiet relaxed atmosphere. Thanks for your business and kind words, we look forward to seeing you in future. Thanks for taking time and letting us know about your stay, we appreciate it and appreciate your business as well. We look forward to serving you in future. Rooms were clean. The bed was very comfortable. Even though it is conveniently located, it is very quiet. It had a great breakfast. The staff was helpful and friendly. Easy to access from 169. There is a washer and dryer on site. Although, the dryer was broken. Thanks for taking time and informing us about your stay, we appreciate your business and comments. We look forward to serving you in future. There's absolutely NOTHING that went right on this stay. From the minute we checked in EVERYTHING was a complete disaster. 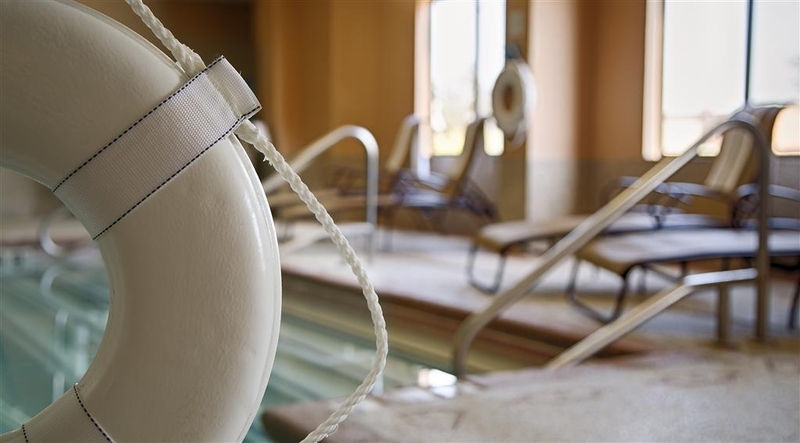 The "heated" pool as advertised on the website was ice cold and according to the Front Desk person and the ACTUAL OWNER " has never been heated. The hot tub didn't work half the time. The "free Wi-Fi" was non-existent as it didn't work either. Hot water must not be a necessity anymore because the room had NONE. Shower was ice cold and floor incredibly slippery. The only decent thing they had was breakfast but even that was disappointing after everything else. 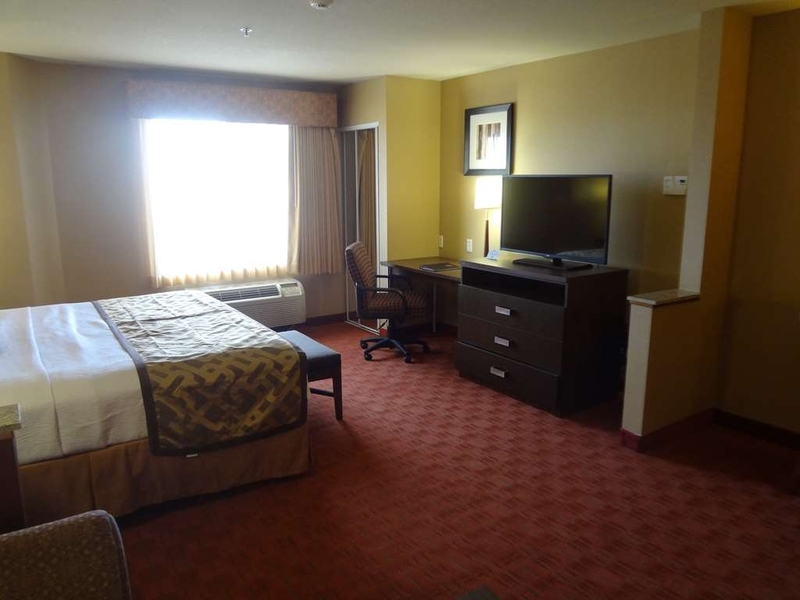 I've never had a problem before with Best Western but after the stay in this hotel I'll NEVER think about staying at another one again even if the entire stay is comped. Overall just plain HORRIBLE hotel. The ONLY reason they got one star is because negative stars aren't an option here. We want to thank you for taking time and letting us know about your stay. Just for the record our pool is heated and set at the temperature recommended by the local health department, we will educate our staff about this. Hot tub has been working correctly and has a 15 minutes timer which can be reset immediately after it turns off. I personally came and check your wi-fi and you were able to access the wi-fi on your hand held devices but you were not able to access on your computer as a firewall settings in your computer was unable to access our terms and condition page. Our entire property had plenty of hot water, and there was plenty of hot water in the room you were staying in - it just had to be adjusted on the hand held shower for proper temperature. In future please let us know (or anywhere you stay) if you have any issue and we can help to resolve it and take corrective actions immediately. I apologize for any inconvenience this may have caused you, I hope you consider staying with us again in future, please give me a call and I will personally make sure you stay is better than you expectations. "Lovely room except too dark"
We stayed only one night and were upgraded to a suite. The room was very large and comfortable. Our only complaint was that it was dark, even with all the lights turned on, especially after we closed the drapes for the evening. The couch was very comfy, but there was no lighting above or next to the couch, so reading a book or newspaper was not possible - too dark! The bed and pillows were great. Didn't eat breakfast there because we had a breakfast date with family who live in Tulsa. Thanks for taking time to let us know about your stay. We take every comment/suggestions from our guest seriously and implement changes as necessary, we certainly appreciate your input.. We look forward to seeing you in future. had a wonderful time.nice and clean with very comfortable beds.had a lot of fun in the pool.and a great breakfast the next morning it had many different things to eat and choose from.rooms were very clean and stocked with plenty of towels.front desk was very nice and very helpful.it was a very quite motel and very relaxing.grand kids enjoyed the pool and the pop and snack machine on every floor.the laundry room was very nice and convenient. Thanks for staying with us and your kind words, we are glad you had great time during your stay. We look forward to seeing you again in future. This hotel was nice enough. There wasn't anything majorly off putting nor was there anything extra special about it. It was clean and quiet, with comfortable beds and had a nice free breakfast. The location is maybe a little odd as it sits back behind a car wash and was a little outside of the busier part of town, which some may actually like... it was still close enough to get to restaurants and stores in a decent time. Thanks for your business. We look forward to serving you in future. 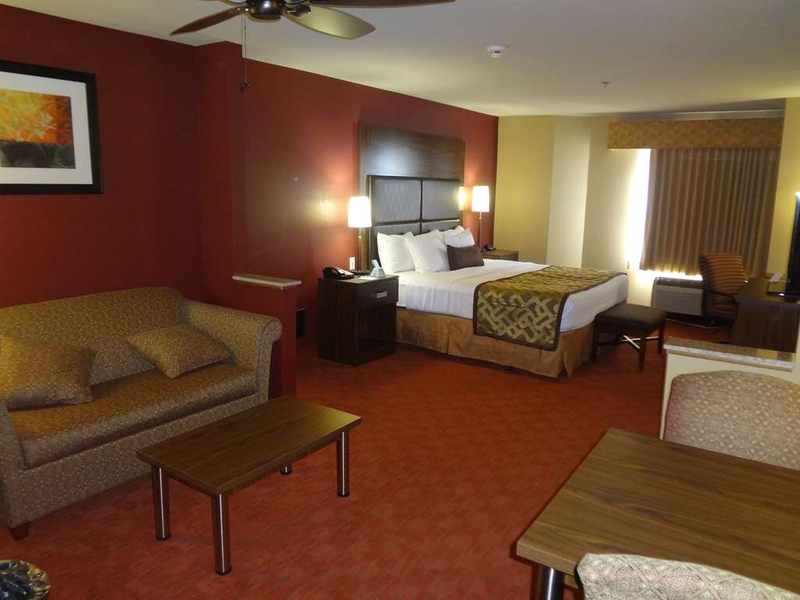 "Friendly Staff and big rooms"
We really enjoyed our stay at this Best Western. The Staff was very friendly, the hot breakfast was great every morning, the room was spacious (even with our three children!) 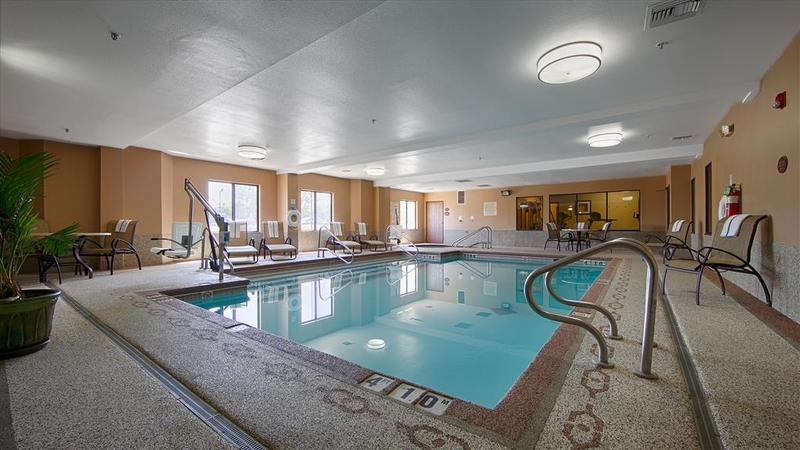 One thing that drew us to this hotel was that it had an indoor pool. However, the water and room was a little cold, so we got in the jacuzzi but the water in there wasn't much warmer surprisingly... The gym had good equipment. Thanks for staying with us and glad that you had a wonderful stay. We apologize about the pool temperature, although we have to stay in the local health department codes for the temperatures. Hope to see you in near future. All the employees were fantastic!! Even thou there was remodeling being done it was still a pleasant stay. The remodeling crew would stop working so any guest could make their way thru the lobby without the noise. The front desk clerk apologized several times for the inconvenience. The room was clean and the bed was comfy. Got me some sleep!! Thanks for taking time and letting us know about your stay and excusing our remodeling mess, hopefully you wont have to see that on your future visit. We appreciate your business and look forward to seeing you on your future stay. I check into the hotel the day my pipes busted. A great escape from the work being done at my home. The room was heaven sent. Hotel quite, and nice workout with a good swim. And now I was relaxed and slumbered into a comfortable bed to wake to a good buffet. Thanks for your business and are very pleased that you enjoyed your stay, now you have a new place to go for a little get away! Look forward to seeing you in future and we hope that your plumbing doesn't give you any more trouble. All staff was professional. Washer and dryer available. 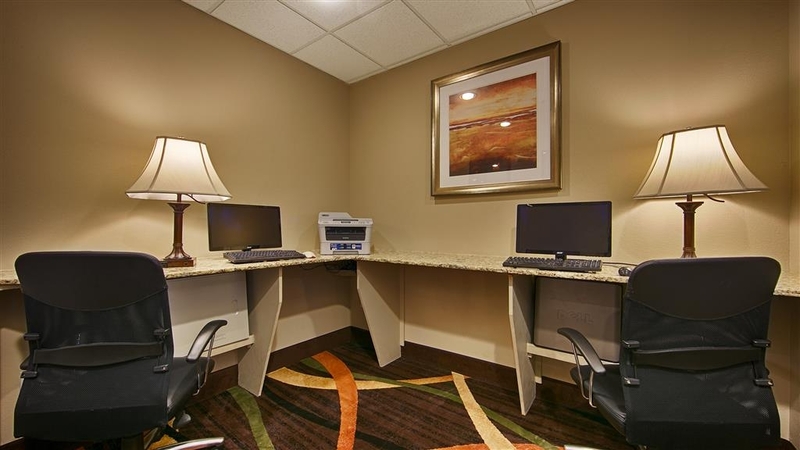 Business center available 24hrs. Front desk attendant always available early morning or late. Location was great for shopping meals, gas and car wash. Thanks for taking time and letting us know about your stay, hope you had great Xmas get together while visiting Tulsa with your family. Look forward to seeing you in future. Thanks for choosing our hotel every time you visit Tulsa, we appreciate your business and look forward to seeing you in future. I found a toenail in my bed at the pillow area when I first got there and sat down to plug in my phone!! Also found a dirty sock under the air conditioner. The day we were out, out trash was emptied, however our beds were not made and the floors were not cleaned. We were given clean sheets that we used to change all of the beds. Appearance and appointments for the room were nice. There was even a ceiling fan with a fold-out couch. There was not enough lighting in the room though. The lobby area and service people were very nice, but wasn't pleased with the cleanliness. Thanks for letting us know about your stay and we are very sorry that you had the experience you had. Please call me ahead next time and I personally will make sure that your stay is above your expectations. 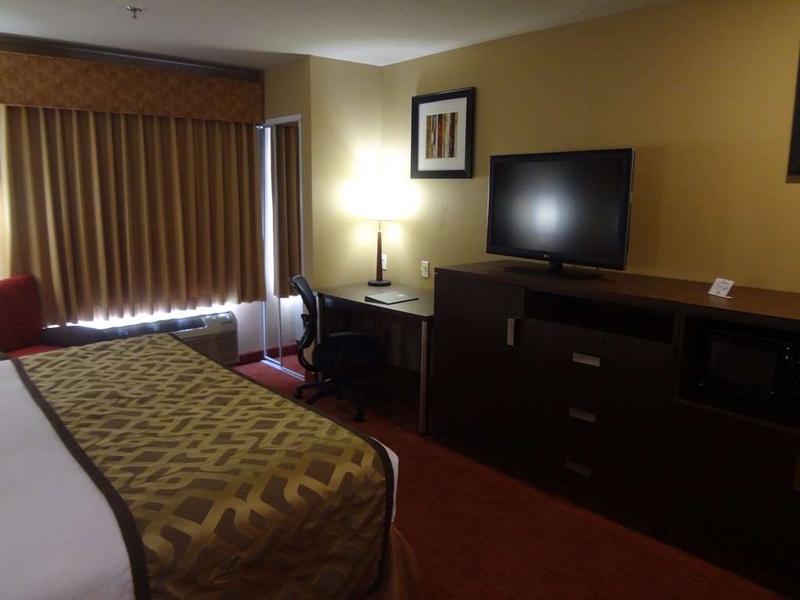 conveniently located, nice people and clean environment. Getting into and out of the parking lot can be a challenge during rush hour. I felt safe in the location. There was a school and playground with kids next door. We are glad to hear that you had a good stay, we look forward to seeing you in future. "Old Hotel with cold showers and bad pool hours"
So the location is about 20 minutes from the downtown area, so it is quite and a little confusing to get to. We went though a few wrong parking lots until we turned into the correct one. We got in around 9:30PM hoping to hit the hot tub and pool; however, the pool hours are from 10AM to 10 PM, so we could not use this area at all during our stay. The rooms were big and so are the bathrooms, BUT the rooms are very old and smell odd. I choose to were my shoes the most of the time, not wanting to put my bare feet on the carpet. The worst part was the showers. Even with the knob turned all the way over to the hot side, the shower was only a little warm. The staff was awesome! we enjoyed the woman who checked us in, but the rest of the stay was pretty poor. We are sorry that you had less than perfect stay while staying at our property, we apologize for that. I hope you give us second chance and if you do please give me a call personally and I will make sure your stay is just the way its supposed to be. Started out bad from the beginning. Made reservations, check-in starts at 2 p.m., arrived about 3:30 p.m., room not ready. Had to sit and wait. Room a little sparse, carpet stained. Mini-fridge was barely cool, no time to call down because we were running behind for our evening event. The next morning the shower was cold, the water only warmed to "almost warm" after running the water forever! Not the way I wanted to remember our 40th wedding anniversary. We are so sorry to hear that you stay was not what you expected, we apologize for that. I hope you will give us a second chance to make things right, please give me a call and I will personally make sure that you are satisfied with your stay. Your response to me about the TV is bunk. Nobody came to my room to show me anything. The brightness was dark, not correctable, and it was not possible to read the names or numbers on basketball jerseys or even to see if basket was made. The sound went up and down sporadically, and often shut down completely as I reported to your staff. So your response is bunk. If this is your best solution, good luck on your next career.This one should be over soon. Just checked in. After unpacking found TV was not working well Front desk could only move me to another room, not acceptable. Otherwise hotel seems very nice, but my 3 rooms twice a year will find another hotel. I want to take this opportunity to thank you for your business and am sorry that you had less than perfect stay. However the television now a days have sensors in them that when the room is dark the TV automatically goes little dim for the easiness on the eyes. As you had seen when we came to assist you with this issue when we turned the lights on in the room, the TV vent brighter. I hope that you will consider staying with again and if I can be of any further assistance feel free to let me know. "Good Best Western - Comfortable Night"
This is a good Best Western. It has an indoor pool. We had a comfortable night here. The staff are very friendly and accommodating. The rate was very good compared to other BW hotels in the area. The breakfast area appeared to be large enough, but it was overcrowded at 8:30 am on a Saturday. We were able to find seating at two overflow tables in the lobby. The parking lot is cramped and the property is squeezed in behind a car wash. Some guests had to park on a grass lot between the hotel and car wash. Be warned that they will charge you $1.50 for an in-room safe whether you use it or not. It is not mentioned at check-in. It may have been in the fine print when I booked the room online. Thank you for staying with us we appreciate your business. The lot next to the hotel is for overflow parking in an event when all the spots are taken around the hotel. We had couple of teams staying on the property when you stayed with us and quite a few of them were eating breakfast at the same time, so we agree the breakfast area was certainly crowded, that's why we have more seating outside of that. The safe charges are clearly mentioned on the registration card at the time of check in and guest initials that, how ever it can be removed at guest request any time. The entrances are designed by the city of Tulsa and there is very little we can do about it. If we can assist you in future please let us know. "VERY GOOD VALUE & LOCATION"
The value and location of the property was very good. Although it is situated behind an automatic car wash, it was easy to access Hwy 169 during the morning rush hour & I was able to get to my first morning business meeting on time. The front desk lady (Quatilla- I'm sure I butchered her name) was very friendly, nice & helpful. She gave me good directions to a store that I was needing to get to the evening I checked in. We were glad to have you as our guest and are pleased to hear that you had wonderful stay, we look forward to seeing you in future. 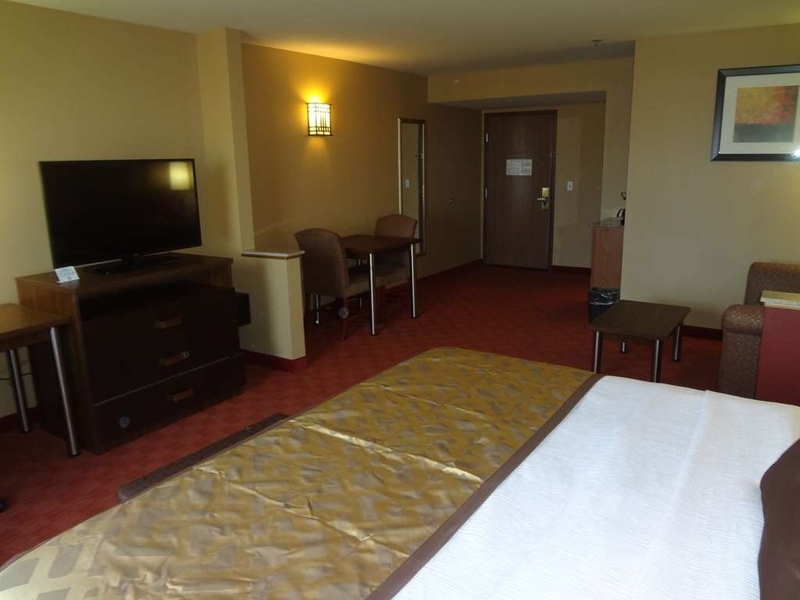 They price matched me for the Priceline price, they were very helpful with anything I needed, the room was clean. What more could you ask for? The breakfast was great and you could smell the bacon from down the hallway. The shower had an overhead sprayer. The staff was very friendly. There were lots of children playing in the pool area. It was a good hotel! We want to take this opportunity to thank you for your business and are glad to hear you had wonderful stay and look forward to seeing you in future. "BEWARE!!!! Watch your bill for the "safe" charge"
Thanks for taking time and letting us know about your stay, we appreciate your business. Thermostat are called green thermostat and they go to default settings when it senses no movement in the room thus saving energy. We apologized to you about the safe (although it clearly mentions in the registration card which the guest initials at check in) charges which was removed thus resulting in another charge on the card and as I mentioned to you before the incorrect charges was dropped off and it takes 3-5 business days to show on your side, unfortunately that's the way the credit card companies work we don't have any control over it. The desk clerk was new and did not know how to rectify this, my apologies for this again and further training has been scheduled. The driveway and the signage is regulated by the city of Tulsa zoning department and we have put in the maximum allowable signage - yes its frustrating for us as well. Thanks for assuring us that you will be back to our facility and we look forward to serving you in future. 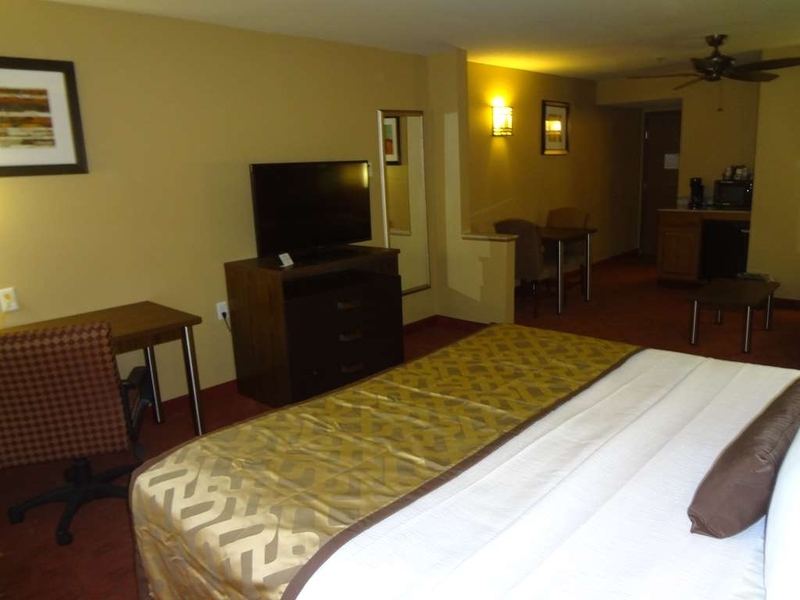 "Very Quiet and Clean Hotel"
Best Western Plus Woodland Hills Hotel & Suites, Tulsa, OKLAHOMA was an extremely quiet place to sleep. The hotel staff was friendly, the breakfast was very good, and the hotel and room was very clean. The swimming pool and Jacuzzi were nice too. Thank you for your business and are glad to know you enjoyed your stay, we look forward to seeing you in future. Very friendly and helpful staff. The pool and hot tub were great and the breakfast was wonderful. Very caring staff all the way to the manager. Night manager gave us a great recommendation for a nearby place for dinner. Thank you very much for your business and look forward to seeing you in future. "Slowest internet we have found"
The slow internet was not the real reason for only 3 stars. 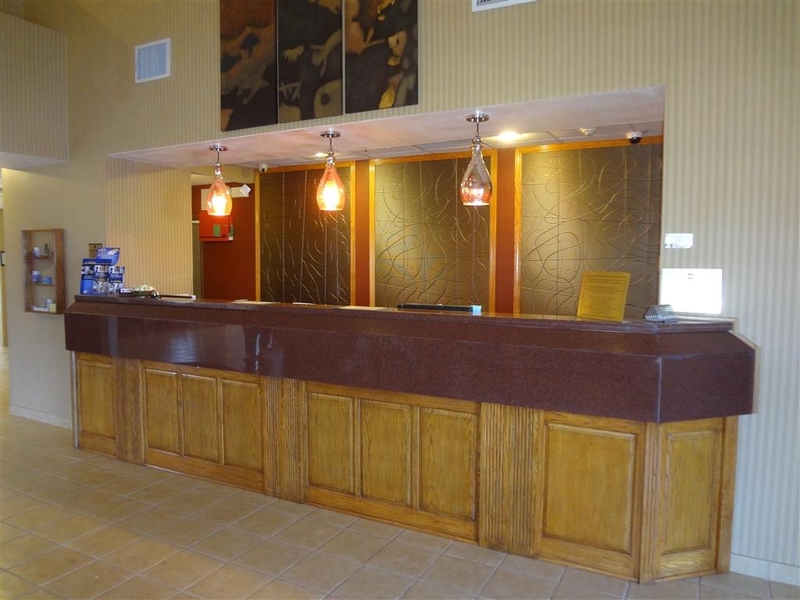 The difficulty finding the entrance and the desk clerk at check in were the main reasons. We followed a GPS and still found it difficult to find the entrance. A larger sign or something would be a big help. What really turned me off the most was when we asked where to eat. We were asking for suggestions which have always been good at every Best Western we have used. This time the reply was "Wherever you want." We were told the highway had plenty of restaurants. For a Plus this wasn't a Plus for us. Thanks for taking time to let us know about your stay, we appreciate the comments and suggestions we get from our guest and have taken appropriate actions to correct the issues. Next time please let us know if you have any issues while staying so we can resolve it and not have any inconvenience for you. Unfortunately about the entrance we cannot do much as the city planning committee decides how its going to be. We apologize for any inconvenience this may have caused you, I hope you will consider staying with us again in future if need arises. Please give me a call and I will personally make sure your stay is what it should be - perfect! Great place, elevator was a little scary, when we rode it to the room. Loved the chandelier and waterfall in the lobby. The room was great, slept great but did not have a fan in bathroom, Breakfast was not on point tho. We appreciate your feed back. The bathroom has vent only with the fan in the attic so there would no noise in the room. We thank you for your business and look forward to serving you in future. We appreciate your business and look forward to serving you in future. Thanks. I spent four nights. Check in was fast and easy. 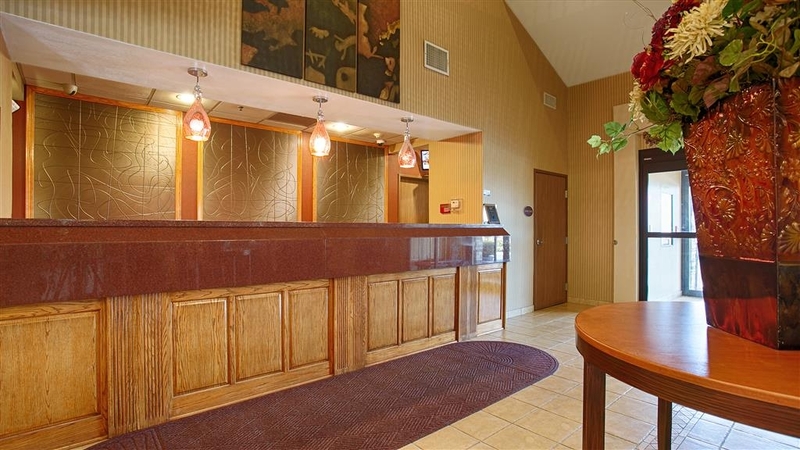 The lobby and rooms are clean and quiet. They have an indoor pool and gym and a nice breakfast buffet. A nice budget hotel. Close to restaurants and businesses. Thanks for your business and look forward to serving you in future. I stayed for a night as a halfway point on my way to Kansas City for the eclipse. Of all the hotels I've stayed in, I'm happy to say this was the first time I was asked upon check in about my special requests. I almost always write "top floor, best view" especially in places I've never been. No one has ever commented on it but the lady who checked me in on Saturday was so nice and asked me what view I'd like and did her best to get me the best. I didn't know there wasn't much of a view in either direction but she chatted with me a lot and made interested in jetting out to take a look around this town I was passing through. The room was nice and stocked. The breakfast in the morning was pretty good and I appreciated they had labeled recycle bins for everyone to use! Indoor hot tub and pool was why I chose it but it was so comfortable, I'm glad it was on the way. Thanks for your business and are very glad that you enjoyed your stay and taking time to let us know about your stay we really appreciate it and look forward to seeing you in future. A tasty, hot breakfast was provided. Room was clean and provided microwave and refrigerator. Bed was comfortable. Location was close to Garden Railway Convention that we were attending. Staff were polite and helpful. We were delighted to have you as our guest and are glad that you have a wonderful stay. We look forward to seeing in near future. Thanks for your business. This hotel was clean, comfortable and economical. It was off the main road a little bit so it was quite at night. The breakfast was good and had variety. Also the summer offer of a $10 per night was a nice bonus. Thank you for staying with us, we appreciate your business. Look forward for your business in future. We took our grandchildren for a minivacation and stayed one night. The hotel was relatively clean and the pool was a huge attraction for the kids. When we finally settled in for the evening we attempted to connect to the wireless Internet. While it seemed as if we were connected, we couldn't access anything. The desk clerk blamed it on multiple users but this was like we were connected to the router but the router wasn't sending the message forward. Sure happy we were only there for one night. Scratchy bedding, thick dust behind the beds, light out in the bathroom, and no bathroom fan were some of the inconveniences. We wanted to take time and thank you for letting us know about your experience at our hotel, we take every comments and suggestions seriously and take appropriate action. We apologize for the inconvenience about the internet connection issues and sometimes is our equipment and at times its the user firewall blocking the surfing. In the bathroom we only have vent and the motor is in the attic so there would no noise in the rooms. Nonetheless, the issues you have brought has been addressed. We hope that you will consider staying with us again and please contact us directly and I personally will make sure you have a great stay. The hotel we usually stay at (and many surrounding it) were sold out. 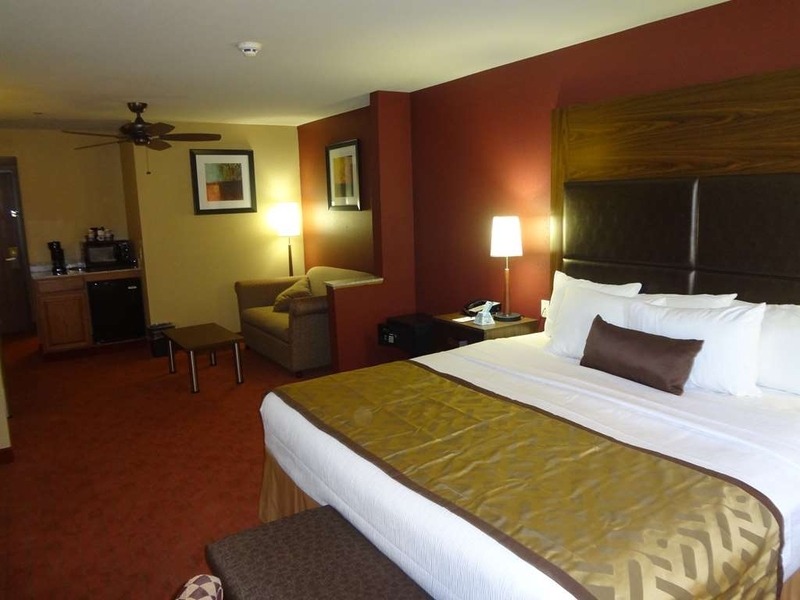 We stayed at this Best Western Plus (the one in Wichita is great) because it was near the Woodland Hills area. The price was great, but there is a reason for that. The room smelled like smoke, and the bathroom lighting was poor. Water wasn't softened or very hot - it is an older hotel. But the bed was a nightmare, literally. The pillows were super flat and the bed was super hard. This is the worst night's sleep my husband and I have ever had in a hotel. Next morning I had a migraine and upper and lower back pain. I would not recommend this hotel. Thanks for taking time and letting us know about your stay, we apologize that you less than perfect stay. As advertise we are a 100% non smoking hotel had you informed us that you feel like it been smoked in we would addressed the issue right away and would have moved you to a different room for your comfort. About our mattress most people loves it and very few don't. Again we are sorry that you were not completely satisfied. 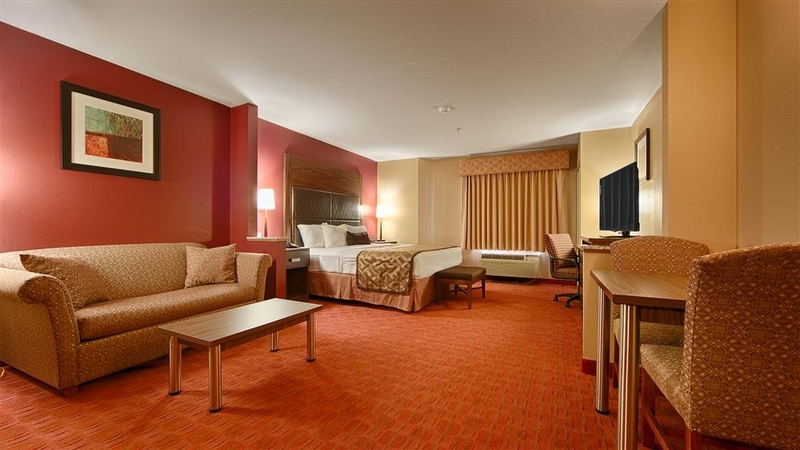 If you are needing a hotel that is clean, reasonably priced, close to just about everything--you can't go wrong with this Best Western. 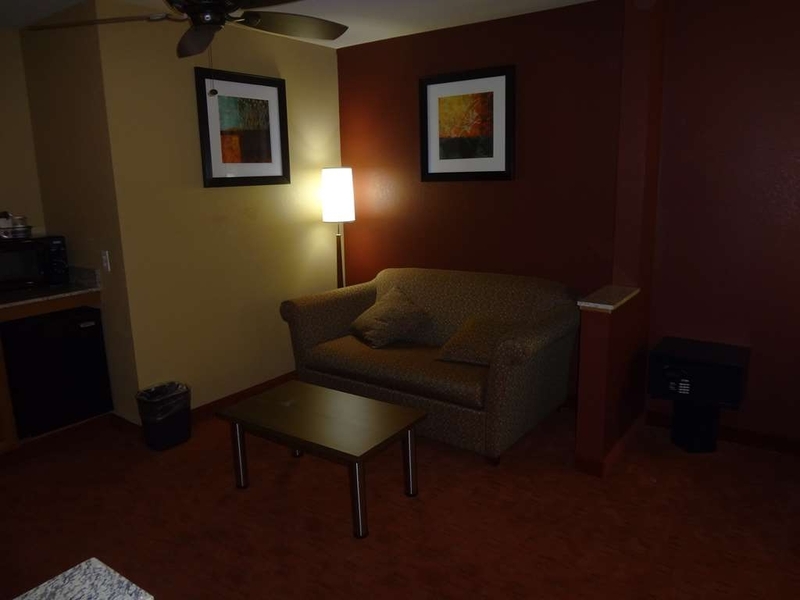 Standard breakfast items offered, comfortable beds, great shower and A/C, safe neighborhood, plenty of parking. You won't be sorry! I would definitely stay here again. We were so glad that you choose us for your stay when visiting our beautiful city of Tulsa, we appreciate your business and look forward serving you in future. Our stay at Best Western was very enjoyable. 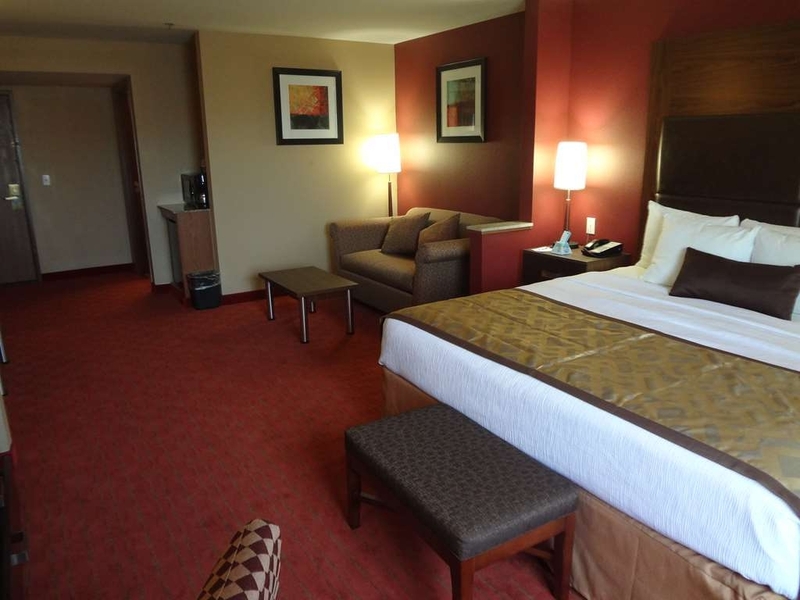 Great customer service and room was comfortable and clean. We stayed a week and enjoyed our stay. 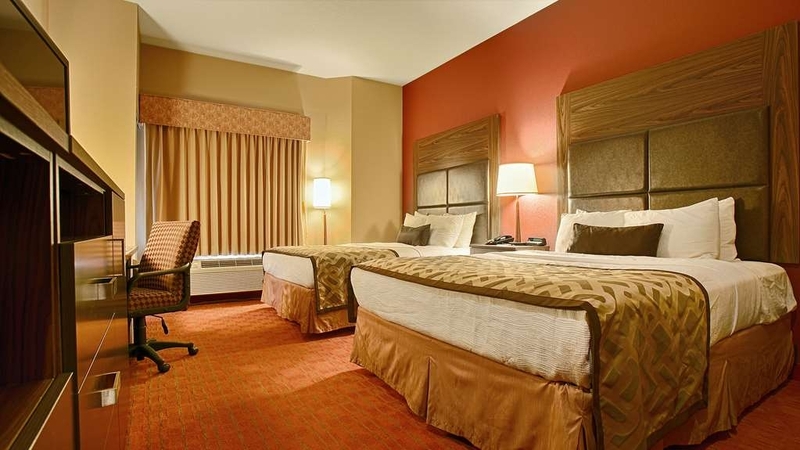 We will be staying at Best Western at our next out-of-town trip. We want to thank you for your business and are glad that you enjoyed your stay at our hotel, we look forward to seeing you in future when your need arises. "Being a Diamond member is totally ignored at this hotel." Being a Diamond member is totally ignored at this hotel. Even when upgrade rooms are available, the manager declines. No Diamond perks were received. The bedding had holes and the towels were well used. In the breakfast area, the microwave did not work, but required to be unplugged and replugged in the electrical outlet. The biscuits were extremely hard and the hot food was marginal. The fruit was old and over ripe. The Manager seemed to have a negative attitude to all the guest and stared down guest while they were eating. The closet space in the room was really small, less than half the size of a normal room. Thanks for letting us know about your experience with your stay at our hotel. We apologize that your stay was less than perfect. However every comment and suggestion our guest makes are taken seriously and appropriate actions have been taken. Although at the time of check in as elite member recognition when asked you chose to get the points added to your account, which we did. We hope that you will consider staying with us in future if need arises. Please let me know and I will make sure you have an excellent stay with us. Gravy was like water, biscuits were like rocks, and the staff seemed as if it was beyond their control and didn't want to hear my complaint. Phone in the room did not work, and they did nothing to fix it. Thanks for taking time to let us know about your experience, we take pride in our hotel and any suggestions or comments made are taken very seriously and appropriate actions have been taken to rectify the issues. We hope that you would consider staying with us again in the future. We apologize for any inconvenience this may have caused you and look forward to serving you again. Stepped on a nail from the carpet coming up off of the ground. The room was pretty dirty still when checked in. Was there on leisure so wasn't at the hotel too often but when I was hotel staff was not working the desk. She was in the pool during after hours. Had a couple of complaints that I needed to report but wasn't able to. We apologize for the experience you had at our hotel, however we have taken appropriate action not to have this repeated again. We hope you will consider staying with us again. Thanks. "Not a good time at this stay"
This time it was not a good stay.Have stayed before all was better except their wi-fi was not good. The agreed upon rate was wrong they did change it but not sure I will not be billed double because did not see a retraction of the old bill. The room wasn't cleaned even after telling them. The food was cold and the serving room was not kept clean and the tables were not cleaned you had to clean them to be able to eat. Thanks for taking time to let us know about you stay, we have taken appropriate action on our end to make sure that this doesn't occur again. Be rest assured that you are not being billed double as I have made sure of that. 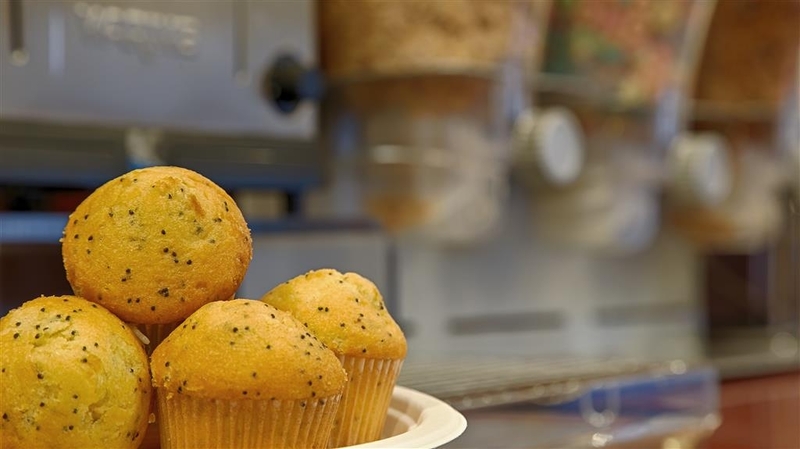 Its not an excuse, however we were extremely busy with couple of youth sports team in house which caused us to get behind on cleaning in the breakfast room due to heavy traffic, but again we have taken necessary steps for this not to happen again. Hope that you will give us another chance to redeem ourselves. I have stayed here many nights over the last few months. Never had a problem. Always clean and friendly staff. 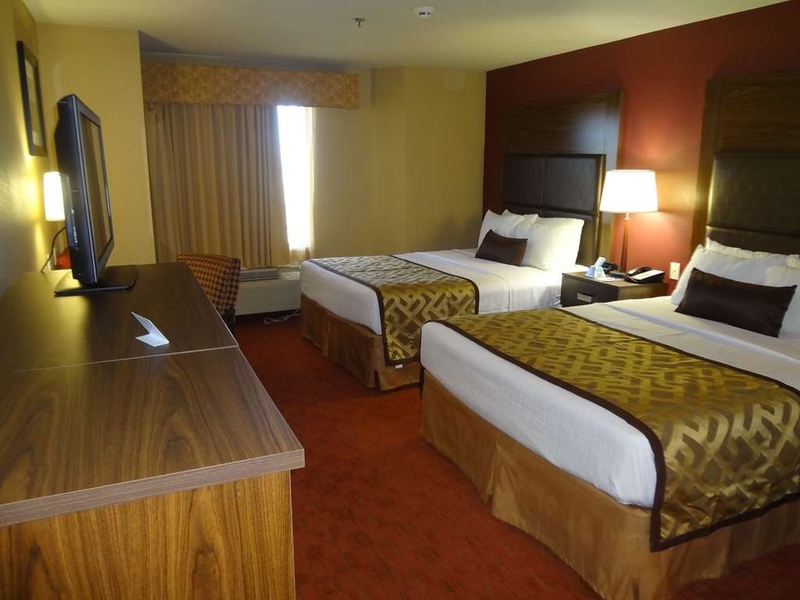 It's my go to hotel in The Tulsa and Broken Arrow area. The beds are comfortable almost as good as home. Thanks for taking time and letting us know about you wonderful stay with us when visiting our great city of Tulsa, OK. We look forward to seeing you again in near future. This is the first time I have stayed here and it was a wonderful experience. Great staff, a very nice room, and a great breakfast! I slept soundly! Since I stay in Tulsa often, I will definitely be back! We were so glad that you choose us for your stay when visiting Tulsa and are so glad that you found everything above standards. We will be looking forward to your future stay at our hotel. Thanks for taking time to write about your experience with us. Nice hotel. Very friendly and helpful staff. extensive breakfast will draw me back to this place again. Will recommend to my co-workers and family. During my last stay one of the desk clerks Priyam was extremely helpful. We appreciate your business and kind words, and look forward to serving you in future. Perfect location to the BOK Center. The service and employees were helpful and very nice. Wifi in room could be improved. Fitness center was pretty sufficient, there was also a pool, I didn't take advantage of it. I should have! Thank you for choosing our facility to stay when you were visiting Tulsa, we appreciate your business and look forward to serving you in future. Front desk staff didn't know how to make a reservation and was not friendly. They did not recognize us as diamond members and I had to ask for bottle of water. We are loyal to stay with them always, but I don't know why anymore. Thanks for taking time to let us know about your experience, your comments and suggestions are taken seriously and necessary steps are taken for this not to happen again in the future, we apologize for that. We hope that you will give us another chance to show you that we do care and appropriate actions have been taken. Thanks for taking time and let us know about your stay, we appreciate your business and look forward to serving you in future. Home away from home, excellent service, good breakfast. A good value. Within 15 minutes to a lot of Tulsa attractions. Very quite area. Pool and hot tub was nice and clean. I will stay here again when in the area. Thank you for staying with us and taking time to let us know about your stay, we look forward to seeing you again in future. Night counter help very good, day not a whole different story all he wanted was to get a perfect 10 on all areas, breakfast very limited items, ng ad to locate entrance to the hotel not marked very well. Address is on 62nd street can not get to the hotel this way have to turn by car wash. Very tight turn. Thanks for taking time to let us know regarding your stay, we appreciate it and this helps us take appropriate action and educate our staffing personals. The entry to the hotel was designed by the city of Tulsa and we did not have much say so in it unfortunately. We hope that you would consider staying with us again in the future if need arises, we certainly value your business. Stayed in the suite with 3 other family members. Sheet on one of the beds was stained. Nephew slept on the hideaway bed in the couch, no sheets, blankets or pillows provided. Stayed 2 nights and the stained sheet was never replaced ( had a black stain on it, not large but definitely noticeable), and they only left 3 clean towels. The breakfast hot foods were all lukewarm both days. Parking is a big problem, only room for maybe a dozen vehicles in front of the building. Just not impressed at all. Thanks for taking time and letting us know about not so great stay at our hotel. We take every comment and suggestions by our guest seriously and act upon it, needless to say that your concern has been addressed and corrected where needs to be. For the parking unfortunately we only have so many parking in the front of the hotel, however there are plenty and enough parking in the back of the hotel for our guest. I hope you consider giving us another chance to prove that we are better than the experience you had encountered when you stayed with us. The room had popcorn on the floor, syrup on the phone, shower was not clean, and a book left by another guest on the floor. The pool was cold and the fridge didn't work. I had a 9 month old baby in the room I was afraid if I put him on the floor he would find something else and choke on it. Thanks for taking time to let us know about your experience at our hotel and we are very sorry and surprised about the experience you had. We take the suggestions and comments by our guest seriously and act upon it. This is very unlike of us although we hope you will give us another chance to provide you a more comfortable stay as it should be. 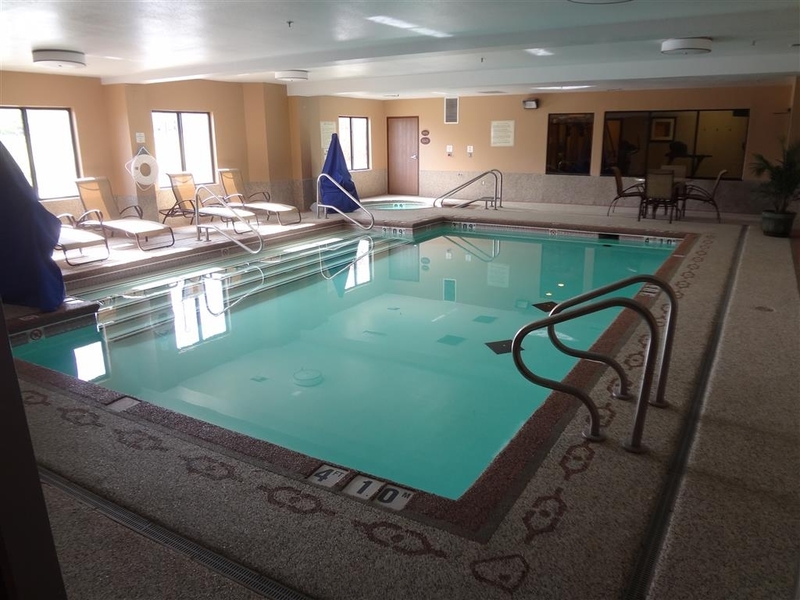 I really enjoyed staying at this hotel, it was reasonably priced and I loved the fact that it had a pool and a hot tub. I would recommend staying at this hotel. Awesome friendly staff. I enjoyed that a full breakfast was included. 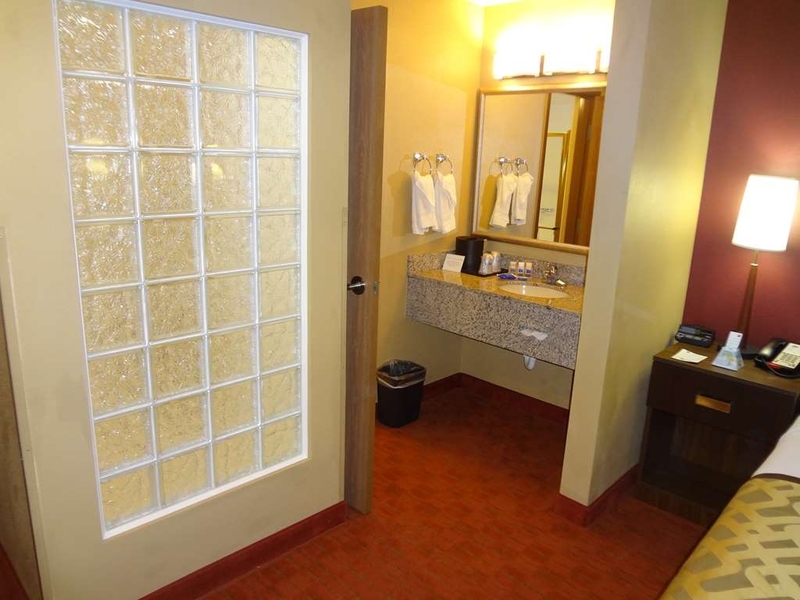 I am so glad that you enjoyed your stay at our hotel when visiting our beautiful town of Tulsa and were glad that you enjoyed our indoor heated pool and hot tub as well as our free hot breakfast. We look forward to seeing you in future. Thank you! Hotel was a little strange on how to get in to, but made us feel a little safer. 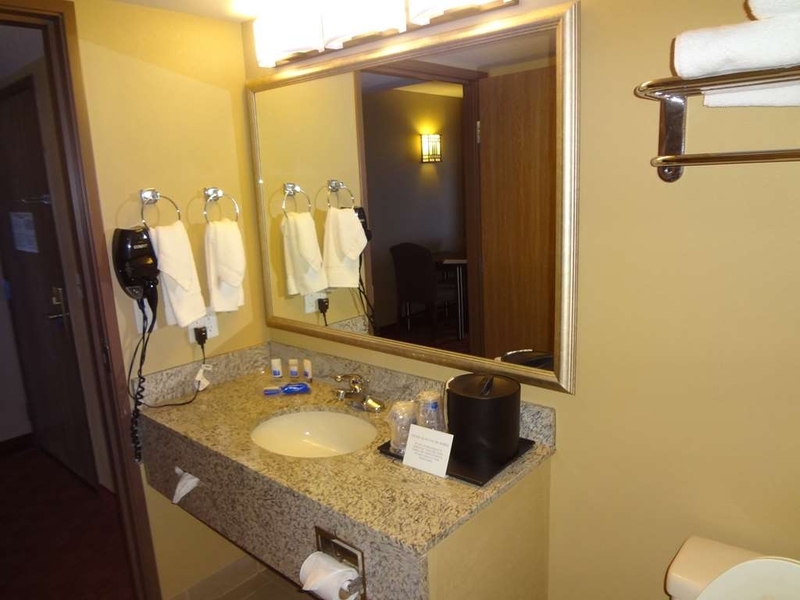 Hotel was clean and staff were very friendly, would stay here again without hesitation. Getting around to the places we wanted to visit, very easy to access the highways. Thanks for the kind words we appreciate your business, will see you again when you visit this area again. I stayed here because I redeemed my reward points and could get 2 nights since it's out a ways. The staff was really helpful discussing transportation options since I was in town for the NCAA tournament. The room was clean and the bed VERY comfortable. Great water pressure in shower. I would definitely stay here again. Thanks for your business and hope you had fun at the NCAA tournament. Hope to see you in future. "Shouldn't be a BW Plus"
Multiple staff at front-desk, none offered to help check-in, visibly dirty, smoke-detectors hanging to the floor w/exposed wires over-night. As if they were in maintenance, but left unfinished, small breakfast, bathroom was terrible, low toilet paper - wasn't replaced, shower-rod was broke - hanging sideways. BW Gold-member, and this just wasn't good. "This is one not to visit"
On almost every detail, this hotel fails to measure up. 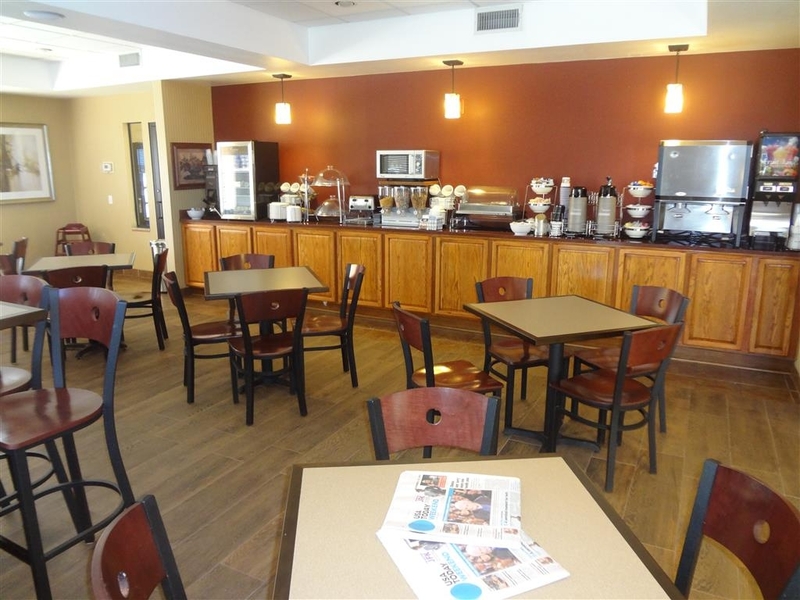 The common areas are dirty, the rooms poorly maintained, the staff inattentive, the outside areas uncleaned, and the breakfast area in need of deep cleaning. To cite the individual deficiencies would run on far too long. 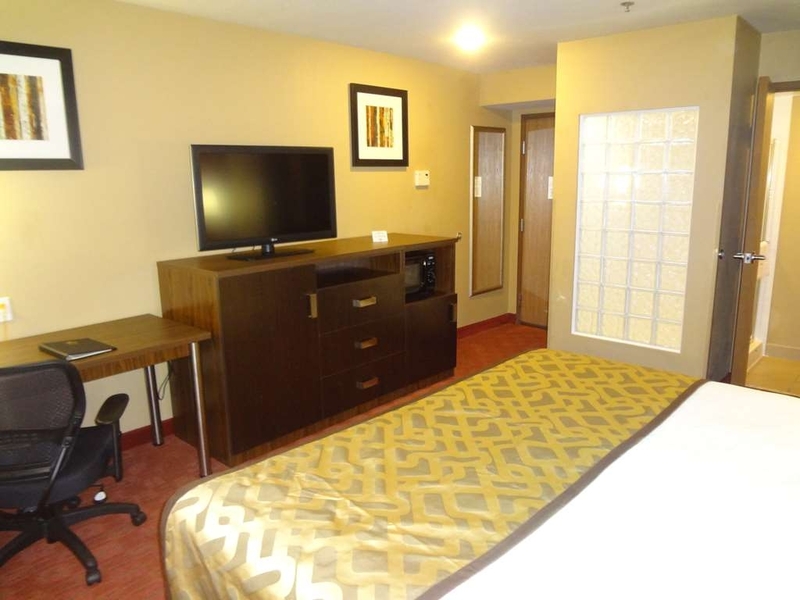 It's a pity as the rooms and building have many upscale features and could be quite excellent. To say the hotel is mismanaged would be a gigantic understatement. The members of the staff are pleasant and helpful but seemingly lack direction. This is a hotel that I will certainly never contemplate visiting again. In considering value it is also wanting. The rate was moderate ($88/nite) but at half that it would still be unacceptable. Thank you for your business and look forward to serving you in future with even better service and enhanced breakfast. This hotel was very nice, very clean and very quiet even though it was full while we were there. The staff was very good, friendly and accommodating. We will definitely stay at this hotel again in the future. Thank you very much for your business and we look forward to serving you in near future. 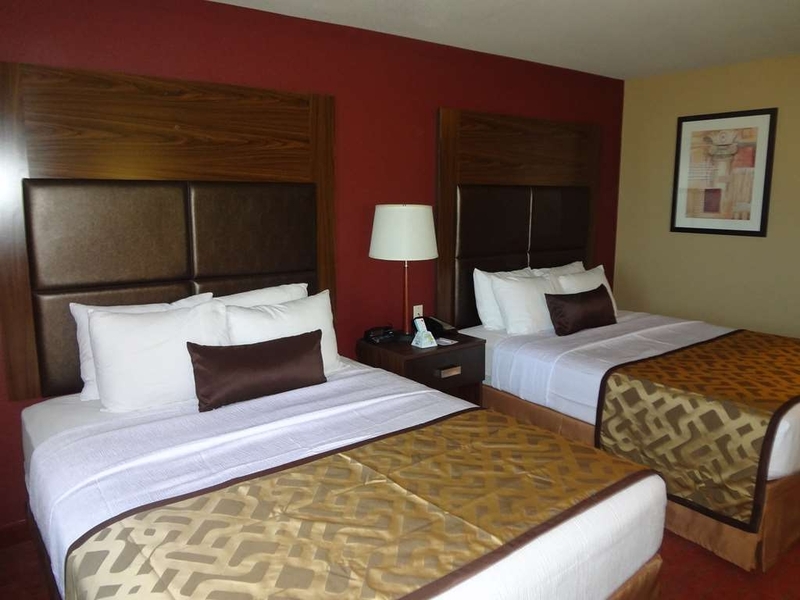 "Best Western Woodland Hills Tulsa OK"
Stayed at this Best Western once before and it was quiet, clean, nice amenities, and no problems with the room, so when we needed a place for the night before a move it was close, so we chose it again and were not disappointed. The controls for the shower were not working quite right, but he staff asked if there were any problems and he was told of this. I feel it will be rectified for the next guest. Thank you for staying with us, we take pride in our hotel and any suggestion or comments given are taken seriously and appropriate action has been taken. We hope to see you on your next trip to Tulsa. Excellent Stay. I will always stay here. Service was excellent and the breakfast was great. Very quiet and clean. The staff was very friend. 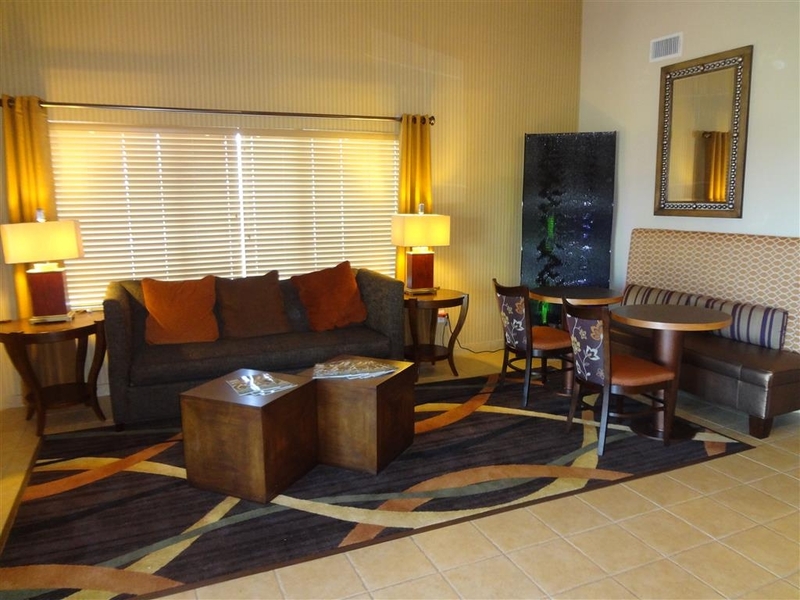 The location is very close to the freeway and restaurants. I would recommend this hotel to everyone. Thank you very much for the recommendation, we appreciate your business and will look forward to serving you again in future. We had no problems whatsoever. Would definitely stay here again. Breakfast one of the best I've ever had in an Oklahoma hotel. Beds slept like they were brand new and expensive. The hotel itself was difficult to find the first time, but once you get there, you can immediately see an easier way to drive in and out. The TV was top notch, and the remote was one of those waterproof washable ones. Fold out couch was thicker than most, actually fairly comfortable. We appreciate you having with us, and we thank you very much for the kind words. We look forward to seeing you again in near future. 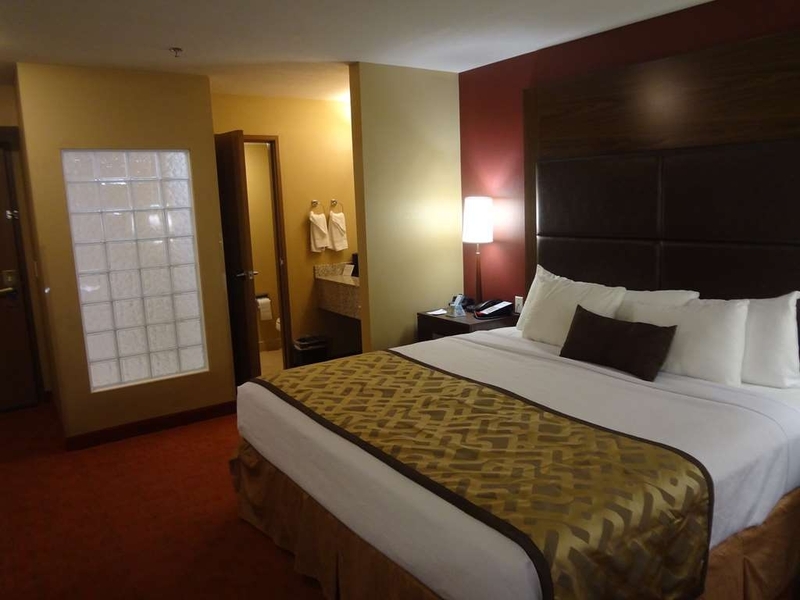 "Best Western Plus Tulsa Woodland Hills"
A great place to stay for business, or leisure. The hotel has excellent, and a very friendly staff. They make sure that all the guest doesn't have any issues. Also I enjoyed the hot complimentary breakfast they provided, and also they provide a very good wi-fi network, which won't stop you from doing your work. Thanks, we appreciate your business, see you soon in near future. I stayed 1 night with my 2 kids. The internet did not work with my tablet but the kids had no problem with their devices. The room was comfortable. Breakfast Monday morning was pulled at 9:00 AM. We didn't have to get on the road really early, so was looking forward to a leisurely breakfast with the kids. The waffle batter was very watery and thus did not make a proper waffle. We made it work though. Thank you for staying with us, we appreciate your business. Sorry you had issues with your tablet not getting on line, however next time please let us know so we can help you fix the issue. We take every suggestion very seriously and take immediate actions to correct it and improve. "Just to get away and relax"
I only stay at Best westerns when I trail if possible. Was disappointed with this one, Check in was great check out not so good the room ac did not cool down very good and the bathroom was a little dirty and the light in the shower did not work the check out lady asked if everything was ok, said no that the shower was dirty no reaction so I did not say anything about the ac and light. when in the area probe won't stay there again. The breakfast not so good. Thanks for your business and am very sorry that the stay was not upto your expectation, this is not who we are. I hope you will give us a second chance to earn your trust back, please give me a call directly and I will make sure that you have a pleasant stay. I really enjoyed our stay at this hotel. It was very close to our family so that was an extra bonus. The rooms were very clean and comfortable. The staff was very helpful and pleasant. There was a pool at this hotel but during our stay it was closed for the season so we didn't experience anything with that. The establishment was very clean. 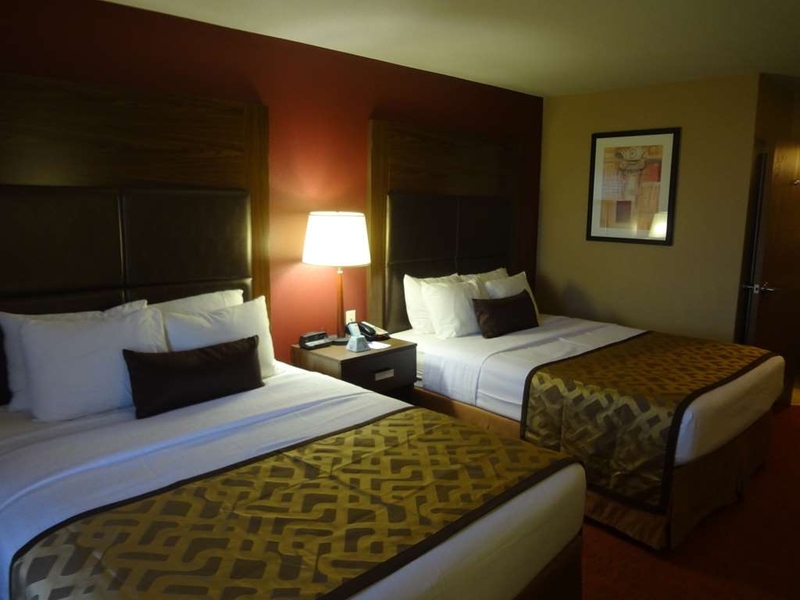 The hotel is located on the outer road next to the highway so it is extremely convenient to access. The bathrooms were very clean. There was tile that looked like wood in the room which I think is a very modern look. Over all very clean and comfy and fairly updated. We appreciate your business and look forward to serving you when you visit your family again in the area. Our indoor pool is open from 10 am to 10 pm all year around and should not have been closed unless its out of these timings. I stayed in a room with a King sized bed. The bed was outstanding and had a great nights sleep. The design of the room was very interesting. Glass Block between the shower and room was really neat. HUGE shower!! Great service and knowledgeable staff. I'll definitely be back when in town. We were so glad to have you as our guest, hope to see you soon in the future and thanks for kind words. The hotel was reletively nice kept. Not as nice as some best westerns I have stayed at before but certainly not as bad! The pool was a little cloudy, but the rooms were nice and clean. Some of the lamps were burned out, which was not the greatest. Air conditioning worked ok. We could not turn on the fan because it was so dusty! Overall it was a good stay, but a little overpriced for the quality of the rooms! 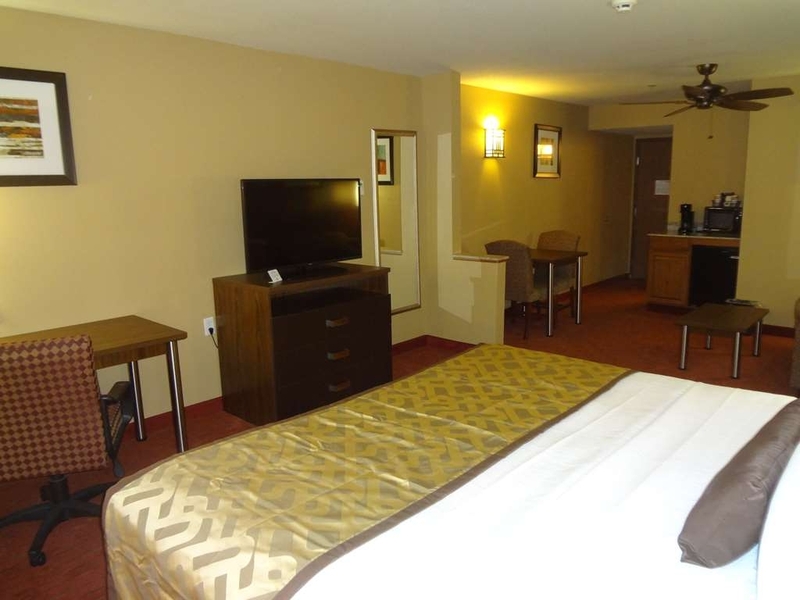 "Mini Vacation to the Zoo"
Overall, a nice hotel with a great location and easy access. Pool could use some improvements. Cluttered with loungers and not much room to move around. Breakfast was good, but again could use some upgrades. seemed low on staff; only 1-2 staffers working areas, it seemed. Room was nice and comfortable and the WIFI was efficient, but had to connect to multiple sources, during stay, depending an area of hotel. The staff there are very friends and accommodating. 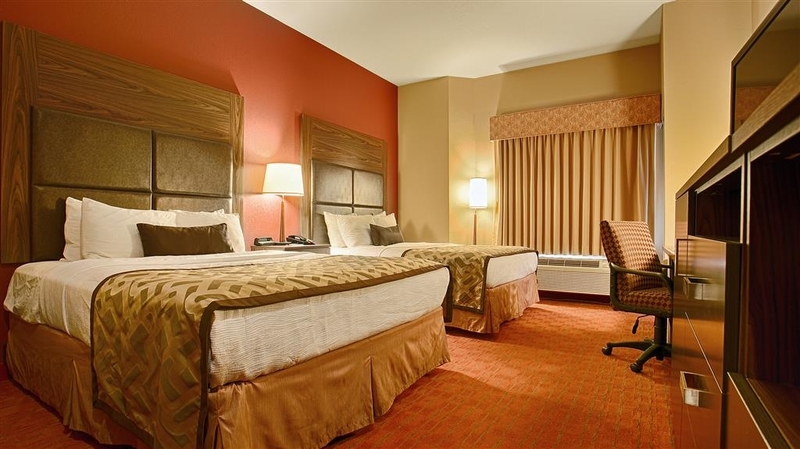 The hotel is beautiful and you get an amazing price for all its amenities. Great Stay and the pool was fun for the whole family! I know where I will stay the next time I am in Tulsa! 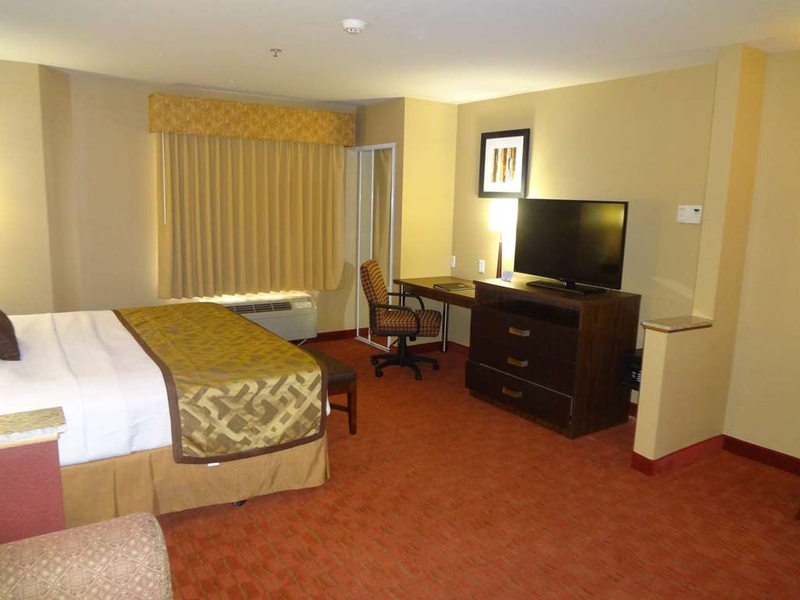 We enjoyed our room, was clean and no issues. Room has safe, fridge, microwave and coffee maker. Staff was very nice. Breakfast was typical, eggs, sausage, waffle , yogurt, cereal , breads, Milk, juice and coffee. Has an indoor swimming pool and hot tub. Would stay here again! 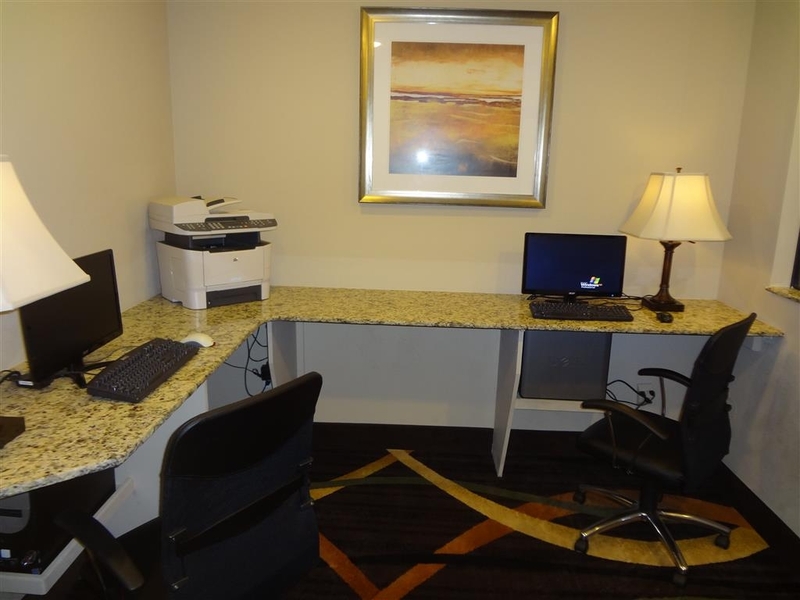 "Nice location and Quiet Hotel"
The hotel rooms are well appointed with good desk for in room work if needed. The beds had a lot of choices for pillow density. 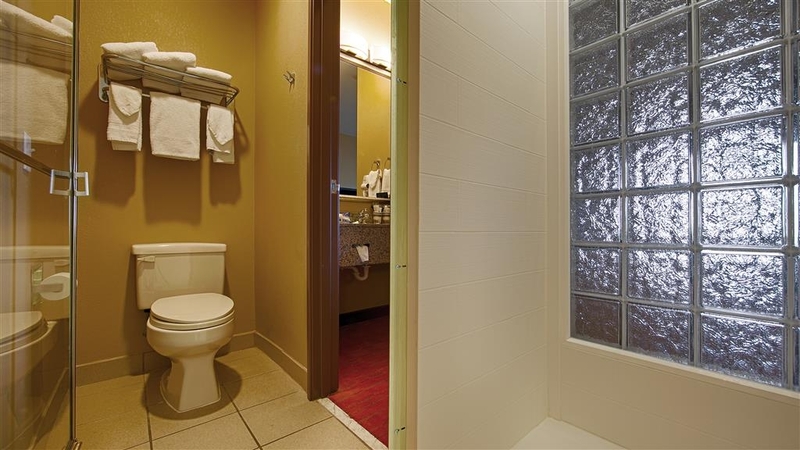 The walk-in shower option provided ease of access and regress along with good water flow for great shower. 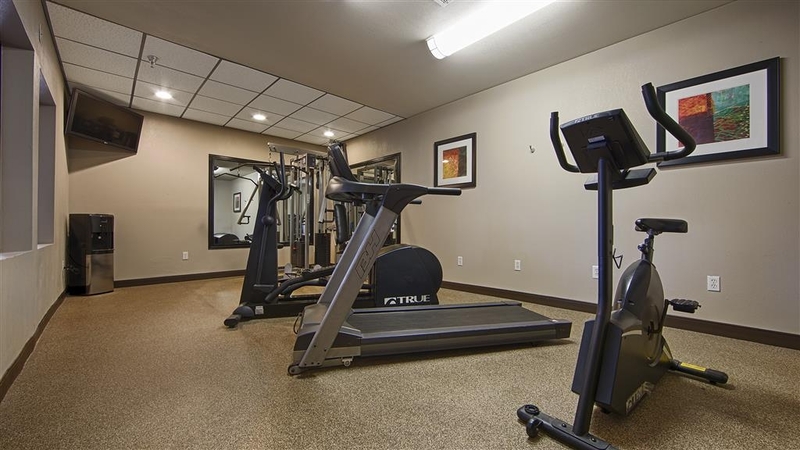 The location next to Hwy 169 gives easy and quick access to all areas of East Tulsa. The check out was the worst. They give award cards but these people weren't trained to apply them. It took over 2-1/2 hours and the problem still was not solved. There also were other problems like a broken shower which was solved. Breakfast items not filled. I would not stay at this one again. But we did stay at two others afterwards and were satisfied. "Horrible breakfast, horrible customer service"
The manager was arguing with another guest in front of everybody when we arrived. Our room was not ready at check in time. The elevator stopped working, breakfast was horrible. Our bathroom was clogged up when we arrived and we have to call guest services. I have had the worst experience I have ever had. the manager acted just terrible and lied about having any reservations for a group of people. i will tell everone that I contact in buisness and personal not to use this motel. 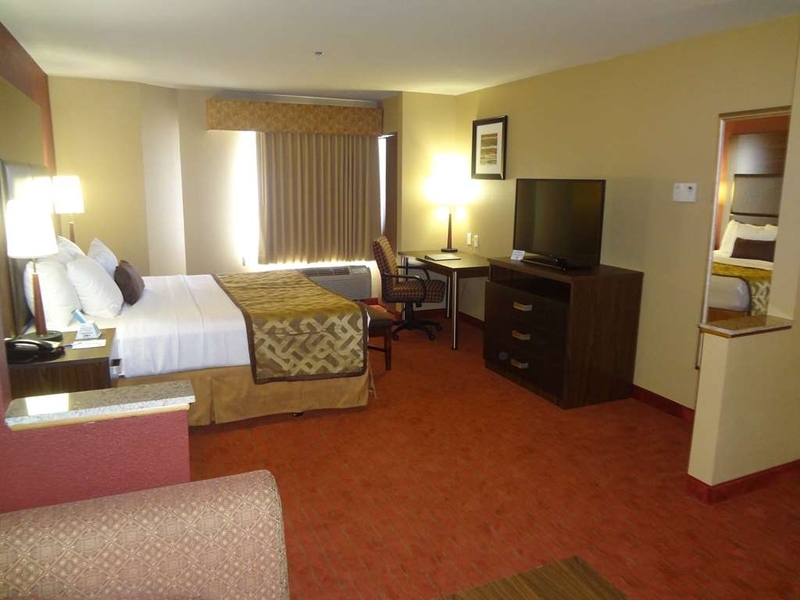 Hotel is in a nice location and very close to some great dining restaurants. Hotel staff are very nice and helpful and they will assist you in anyway they can to make your stay a safe and pleasant experience. Thought that earthquakes were the only things that would cause a room to shake in Oklahoma not true try industrial dryers at 11:00 pm. They will also cause you to wake up. That's not the only thing that will wake you up either. How about an unscheduled wake up call at 6 a.m. with the response from the front desk "sorry wrong room" Avoid this place if you can. I have never stayed in such a filthy hotel and I stay in approximately 20 hotels per year. I have never been so dissatisfied with a hotel room in my whole life. We discovered our room was too dirty to sleep in too late at night and we couldn't leave. The sheets were dull of hair and wrinkly and had not been changed. The pillowcases had yellow slobber stains and the sheets had pink stains. There was no toilet paper or Kleenex in the bathroom and the towels were folded but had ketchup stains. The floor was caked with crumbs and food. We tried calling the front desk every half an hr and never got an answer. In the morning after only a couple hours of restless sleep with no blankets on top of dirty sheets, we told the manager we didn't want to pay one penny for the room. He was unsympathetic, unapologetic, and refused us a full refund and instead said he'd make an adjustment. We were charged the full price with no discount. 50% dirty + 50% horrible customer service=100% reason to never go back. This was a very good economic hotel that I stayed at for 5 days. Location was a bit out of the way, but overall was worth the stay. 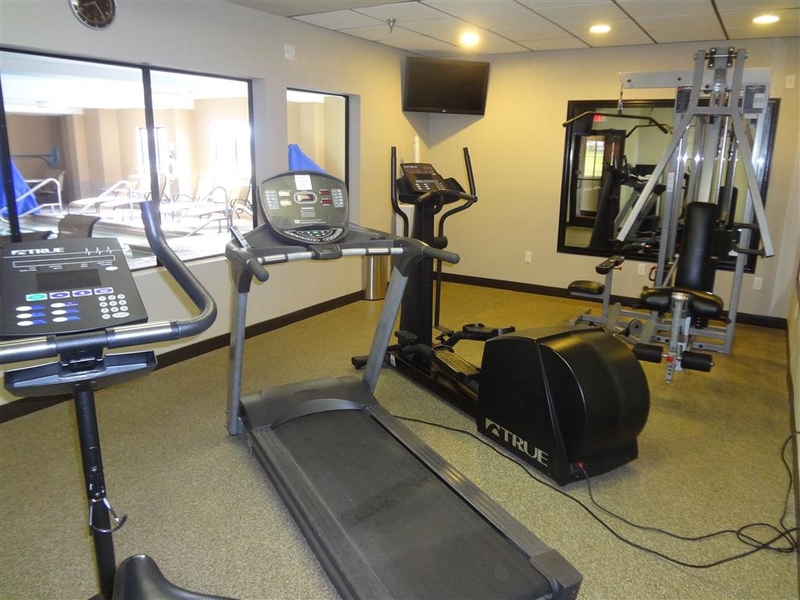 Appreciated and used all of the amenities- pool, fitness room, business room and daily breakfast. Staff helpful, just slow. They charge for the safe unless you ask it to be removed from the bill. The manager of the breakfast bar handles food with her bar hands, bringing out slices of bread a hand full at a time. There was a line at the counter and there was only one clerk. A second person was called out of the office to answer a question, but did not open up a second check-in station to help people. Room was clean and the windows open, which was great because the weather was very, very nice during our stay. Again, the staff attitudes were fine. They just didn't have great skills/processes. We stayed here to stay close the the mall. Which was about 2 miles away. Nice location. Hotel is nice and clean. Rate wasn't too bad. Breakfast and fitness center could be better quality but they did the job. The room was clean and beds were comfy. We were satisfied with our stay. The Best Western was adequate for my week stay. Very friendly staff, the cleaning lady went out of her way to keep my room tidy, a fair price, the bonus of a swimming pool and hot tub(+++), fast internet, adequate breakfast bar and plenty of parking. However, I did not care for the cigarette smell and noisy heater in my room. Hotel hot tub had something that looked like mold growing in it and the water wasn't very hot. A used bar of soap was left in my shower. A woman's hair clip was found on the floor next to the bed. Seems like my room might have been rented out by the hour before I got there. "Feels quietly removed, even though it's close to the freeway"
You'd never guess this hotel was so close to the freeway unless you drove in that way -- coming in through the city, we had no idea until the next morning because everything was wonderfully quiet. 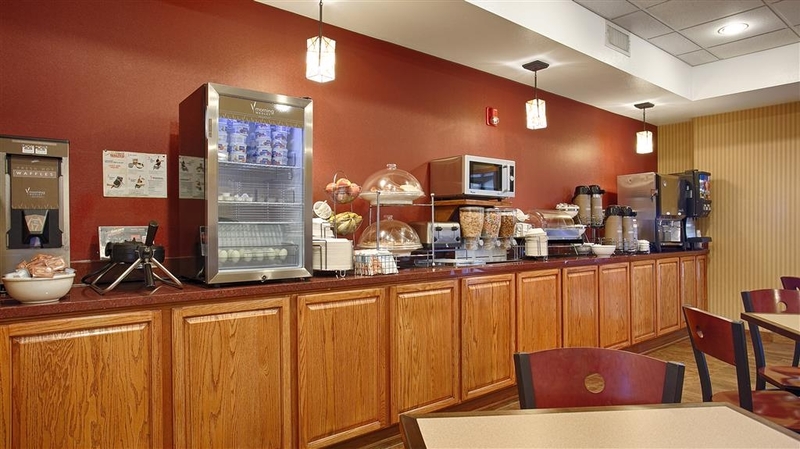 The breakfast room has coffee available even at night, and in the morning there's a great selection of breads / waffles / cereal / fruit / scrambled eggs / sausage / etc. USA Today newspapers are set on a table in case you want news with breakfast. Very hospitable. This hotel is awesome! 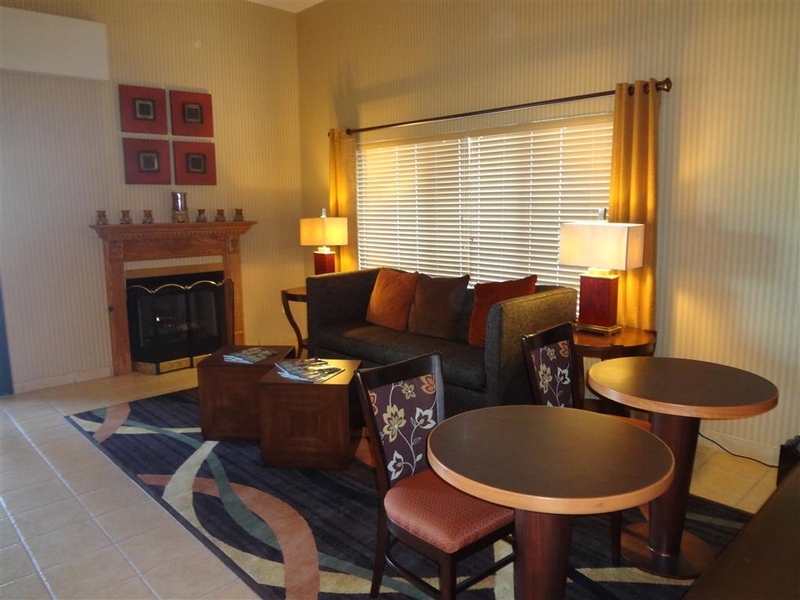 The exterior, lobby, and rooms are very nice - especially for the price! I am not sure if the hotel has been recently updated to a more modern look or if it is new, but it was really nice! 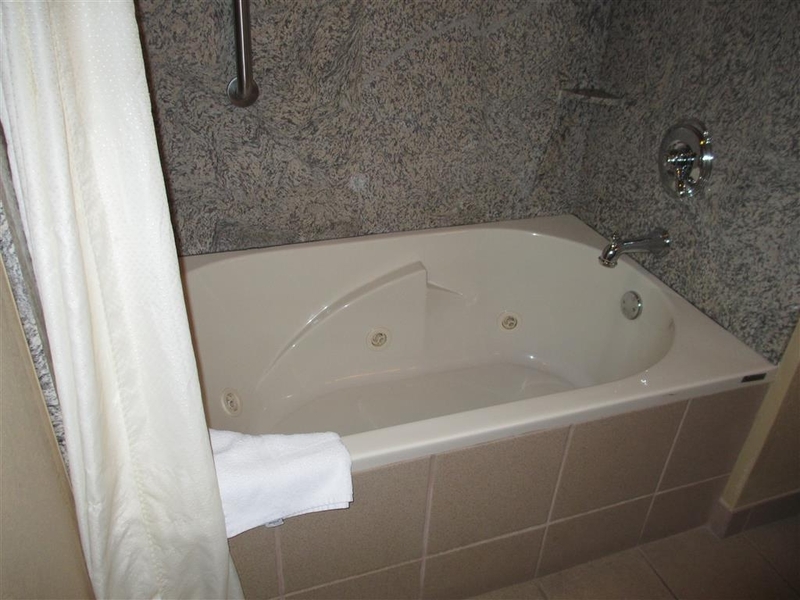 The King Suite was a great size, and the jetted tub in the bathroom is AMAZING!!! I really didn't want to leave that tub! The service was good, and we had no real issues with the hotel except that there was a pair of socks in the corner between the couch and the wall, so hopefully they will just make sure they double check the rooms from now on - overall the room and hotel seemed really clean! 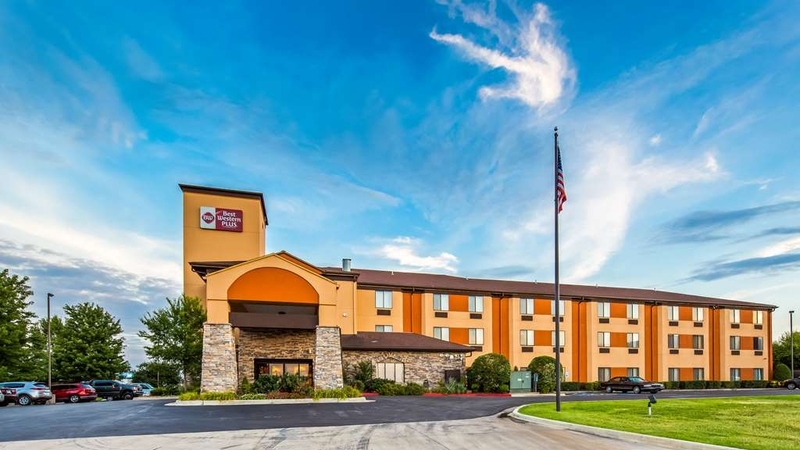 If you are in the Tulsa area, this hotel is a great value if you don't mind being a few miles from the city center - driving to downtown doesn't take long! 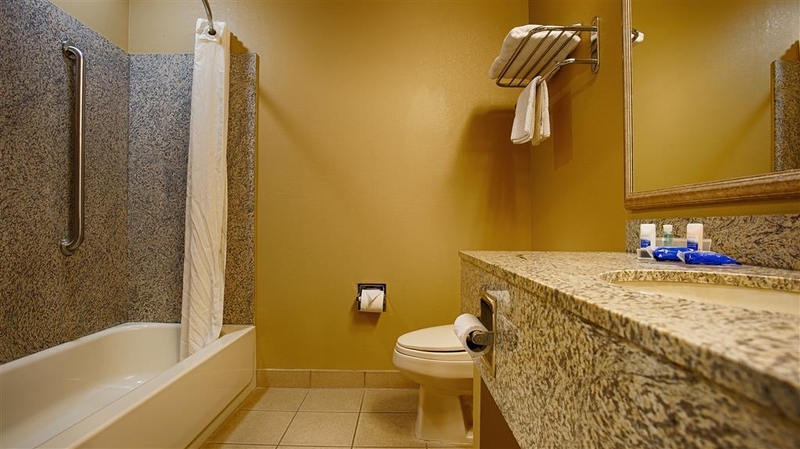 Give this hotel a try and definitely get the jetted tub option! It was simply an overnight stay so, to be truthful, we are not as concerned about the hotel as we are about the location and price. But this time it worked out very well. The rooms were small but the decor was very nice and everything we needed was there. Frig, microwave, safe, large TV and very comfortable bed. Bathroom was good and shower was great. All the extras were there - hairdryer, coffepot and all those other items we tend to forget at home. Staff was very nice and the best for last .....breakfast was above board great. Coffee was wonderful, waffles, eggs and sausage plus everything else you could want. Location was great...right off the highway but far enough off so no noise. Shopping was a very short distance away. Lots of restaurants nearby. The true review is that any visit to or thru Tulsa we have found our hotel. It was handy to my doctor's office. It was off a busy road, so it was very quite. I felt safe. And close to lots of Shopping. I would go back again and till family and friends. Everything was so clean, inside and outside. We stayed three nights during the summer, and the AC in the room was working sporadically. The manager said he'd work on it, and he tried, but didn't resolve. He gave us a discount and offered to make up for our experience during our next stay. We took him upon it. Our next stay was in the fall, and we did get a better than listed price. 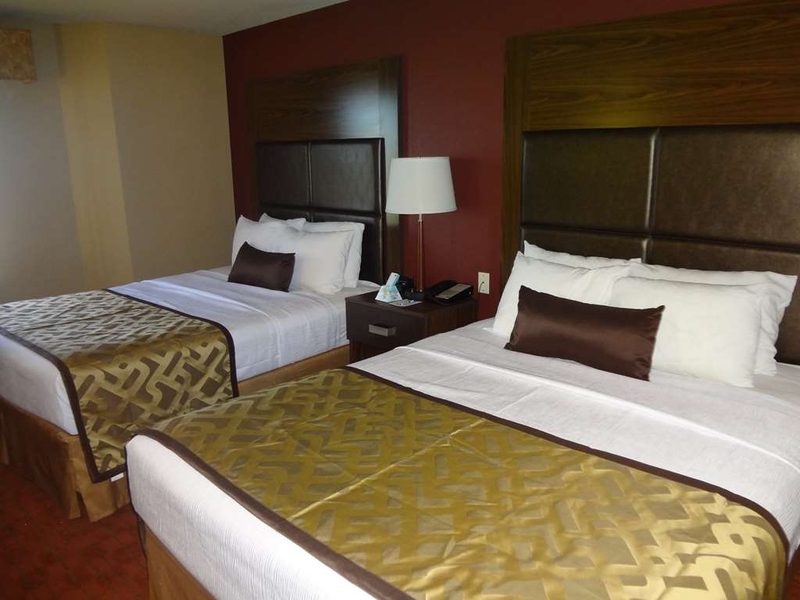 The rooms are very nice, modern, and clean. The beds and pillows are very comfortable. The internet works great. The walls are a little thin, so it's somewhat noisy. Breakfast could use some variety besides powdered eggs and sausage. Yes, there is yogurt, instant oatmeal, waffle mix, a toaster, some fruit, all varieties of tea and coffee, but real eggs and occasional bacon would be nice when you stay more than one night. The location of the hotel is very convenient to the freeway, but the driveway is really convoluted with a blind turn. I was always worried that there would be a car coming toward us that we wouldn't get a chance to see ahead of time. You have to turn in like you are going into the car wash next door, but then veer to the left to get on the hotel driveway. A little weird. Didn't use the pool or the fitness center so can't judge. Our stay was just fantastic. 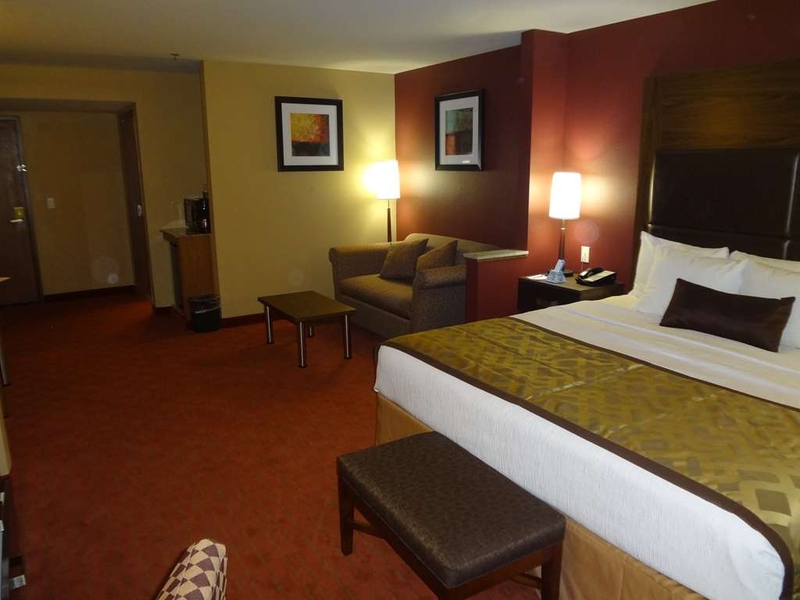 I am glad that I chose this hotel for our stay it was very enjoyable and memorable. The manager Rex went beyond and above the line of duty to help me find good restaurants amongst other things, very knowledgeable & helpful guy I might add . 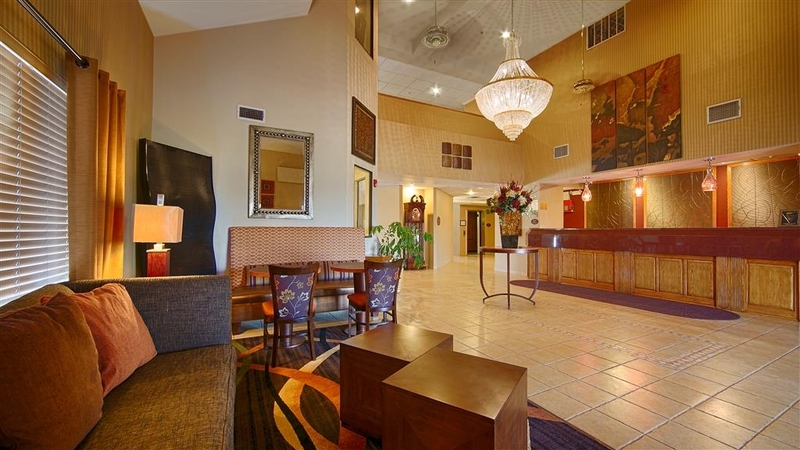 This would be our hotel to stay at when we visit again Tulsa. This is our hotle of choice whenever we visit Tulsa. It is very clean and comfortable. We would recommend it to anyone considering a stay there.There was a hot breakfast that was usual for any hotel but good. We enjoyed our stay. 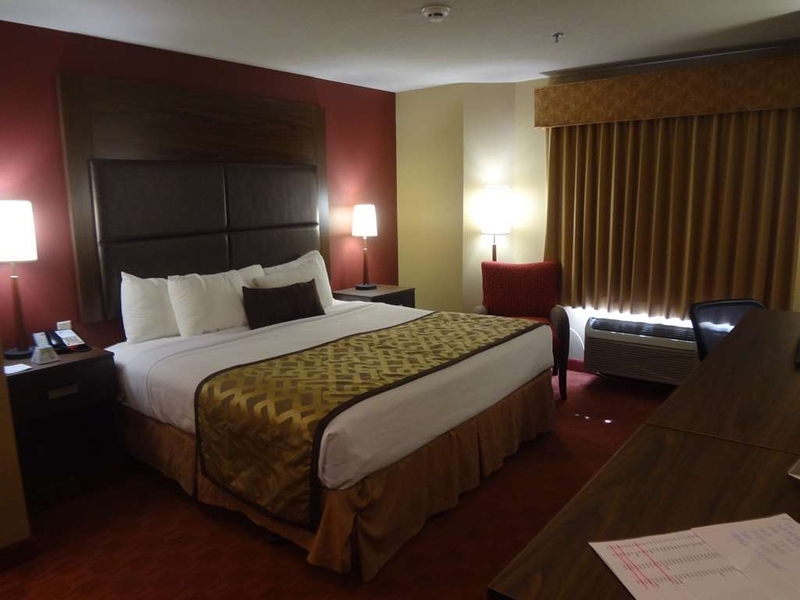 We were upgraded to a nicer room just because and were very happy with it. Only trouble we had was noisy children above us up late and early next morn, but that doesnt reflect on our enjoyable stay! We stayed there this past weekend and nothing but disrespect, unprofessionalism and rudeness. The manager Rex seemed racist and refused to help us in way. He had the worst customer service ever.When I asked a staff member who is the manager, she informed me Rex was. I asked who was over him, she said he is also the owner. I informed him that I did not want to deal with him because he is rude, unprofessional and disrespectful. Instead of trying to resolve our issues or even attempt to apologize he told me to take my business somewhere else. I was there on a weekend getaway with about 25 other people. We all had the absolute worst experience ever at a Best Western. 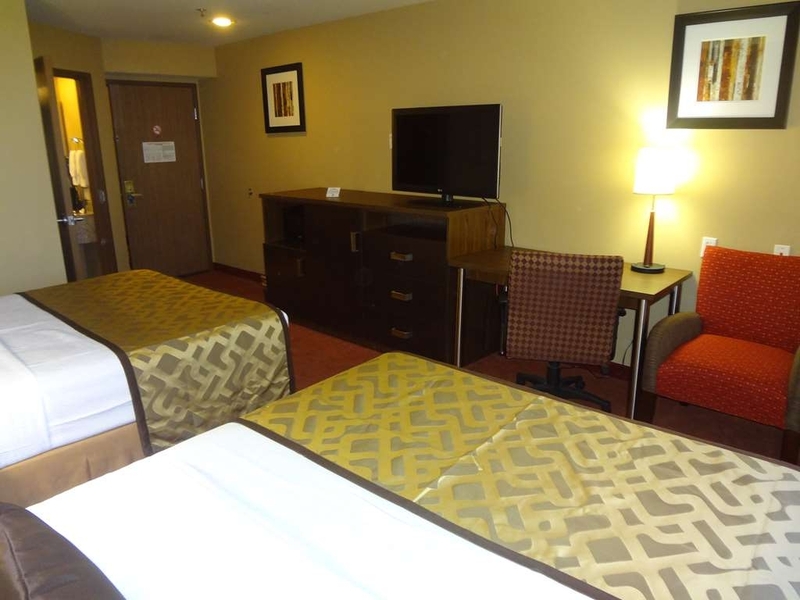 We go to Tulsa every year and every time we stay at a Best Western, there always seem to be an issue but this last visit was utterly the worst ever. Rex kept telling us he can help us and when asked for sheets/blankets for sleeper sofa's we were told all they had was sheets. When asked what are we suppose to do for covers, I was told by a staff member "I can't help you". All weekend long that is all we heard. Upon checking out, we stood at the counter but Rex never acknowledged any of us. He just stood there and ignored us. Keep in mind he was the only one at the counter. I also saw him disrespect other people that were not in our group. He had an attitude when it came to helping white people in general. You see Rex is from Eastern Asia or somewhere to that nature. I am by no means racist but I know when someone is being discriminated against and this was definetly one of those moments. The hotel may be clean but it was the worst customer service experience we have ever dealt with. If you get rid of Rex, I would return. Very clean room, beds were good, great value. Pool and hot tub area were nice. Breakfast was ok. Little weird that no one was ever at front desk and you had to ring a bell, but she came quickly. We will stay again. Room was small, but beds were comfortable and the pool was nice. Breakfast was a great bonus. Did not use the exercise equipment. Shower drain was slow. Advised front desk as we were leaving. Great stay for the money. My daughter (11) loved the giant chandeliar in the front lobby. Clean, quiet, friendly. I'd stay here again. The room was clean but the sheets and towels had a strange odor! It was a okay place to stay and it was in a good location. The owners or managers acted like it was a chore to help you with anything. However, the employees were pleasant. I noticed on Sunday it seems liked they had nobody to clean. great stay! very clean, polite, and speedy. overall great! the pools chemicals were a little too strong both times we stayed so hopefully they will get that under control. WE WOULD DEFINATELY stay there again! love that it is right in the middle of tulsa so it was close to the mall and all of the restaraunts. "Hard to find the entrance but worth the effort"
The room was very nice. The rest of the property was well maintained. The amenities were new and looked very nice. Honestly, this hotel was as nice as many of the more expensive properties we have visited. The entrance to the hotel is a bit difficult. It looks like you are driving in to someone else's parking lot, but once you get there the parking is all convenient the rooms. The staff went above and beyond for the people in front of us that had a tricky situation. That is always nice to see. For those not from the area, the Woodland Hills area is the shopping hub of Tulsa. Movies and just about any kind of store are within very short drives. Also just about any kind of food you would want. Tuesday after Labor Day weekend and the breakfast bar was devoid of eggs. But the pool was one of the nicest around. Clean and tidy. Helpful checkout staff. We did enjoy the bagels and cream cheese. My daughter liked the fruit loops.